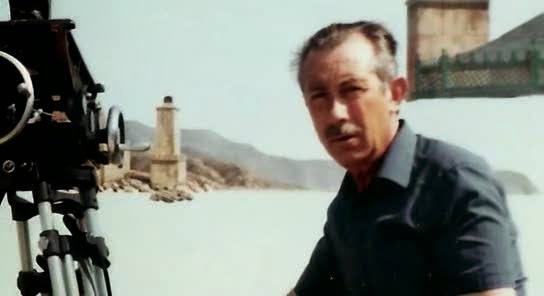 Former Disney matte artist and visual effects supervisor Harrison Ellenshaw poses with the Aires miniature from Kubrick's 2001 which recently came up for auction after more than 40 years in hiding in England. 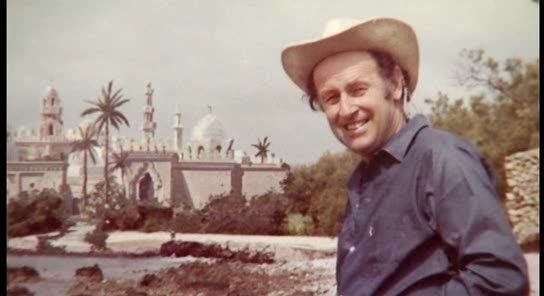 Just before we embark on today's journey of wonder where I will endeavour to celebrate the least acknowledged of all the Ray Harryhausen-Charles H.Schneer pictures I have one or two updates and fascinating snippets of info to share. Firstly regarding 2001: A SPACE ODYSSEY - a classic with still incredible photographic effects work I covered most recently in NZPetes Matte Shot, I have been receiving quite a bit of correspondence from readers and fans alike. Two communiques in particular have stood out as being important - although the news from each writer has been at such opposite ends of the spectrum. Firstly, the bad news. 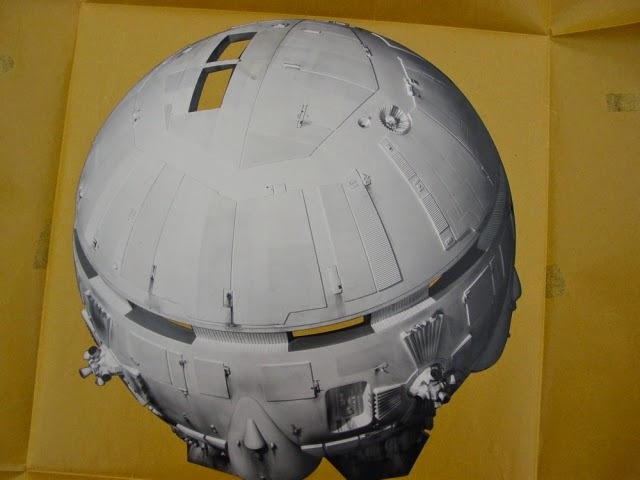 Many of us knew (or thought we knew) of the sad demise of that mighty orbiting space station miniature that The Blue Danube underscored so beautifully in that magnificently engineered and photographed primary space set piece in the Kubrick film. 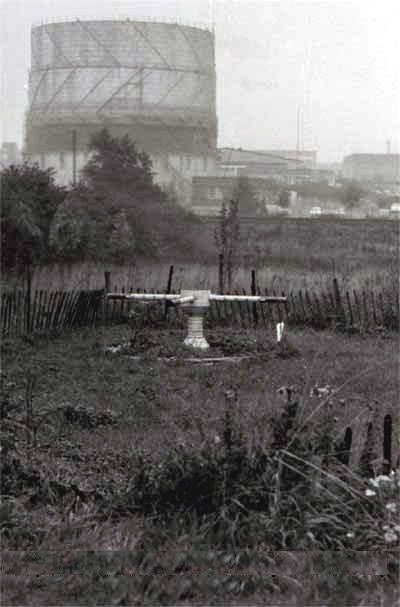 A frequent reader and correspondent, Stephen Perry of Peerless Optical Effects in the UK sent me some depressing photos of the ultimate resting place of that celebrated model, in what appears to be a chunk of vacant, overgrown land somewhere outside London. Stephen has often dropped fascinating tidbits of effects info and pictures to me over the years, though none as sad as these. Says Stephen: "I Liked your piece on 2001, I found these pictures of a sad end to a great model in someones garden or allotment. Also one of the cutouts of the Aries B1, no idea what size the cutouts would've been since the glass sheet on the sausage factory device was 15 feet wide. 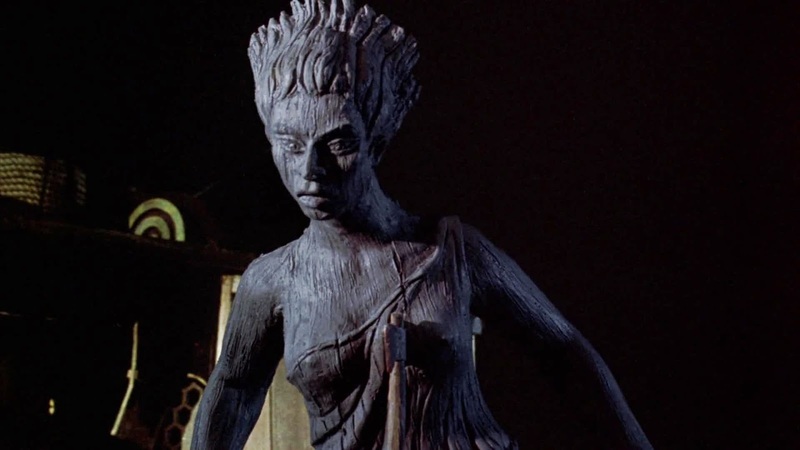 When I was at Peerless we had an Australian rostrum camera operator come in who'd worked on 2001 and he said that the 65mm Oxberry rostrum bought for the production was dump outside on the MGM waste area and left to rust. When Wally Veevers died he left all his effects stuff to Peerless, unfortunately nothing of any real use mostly cobbled together bits and pieces and nothing from 2001." Close up pictures of a once magnificent and iconic piece of sci-fi special effects, overgrown with weeds and moss. "Hello Stanley... I know you're in there". Well it's not entirely grim news regarding 2001's miniatures. I'm sure you all are aware of the very recent auction where the exquisite Aires moon module went under the hammer (the auction hammer and not the demolition hammer, thank God!). I was so thrilled when another long time reader, contributor and all round really generous guy, Harrison Ellenshaw sent me these wonderful photos. Harrison just had to drop into the auction house in LA and look this marvel of miniature magic over and very kindly sent me these photos, which in themselves are terrific, as they allow us to fully appreciate the sheer scale of the machine which the official auction house pics didn't. Harrison was quite taken by the model and told me so - though not so taken as to bid the $344'000 which eventually the model sold for, which must be some sort of a record. 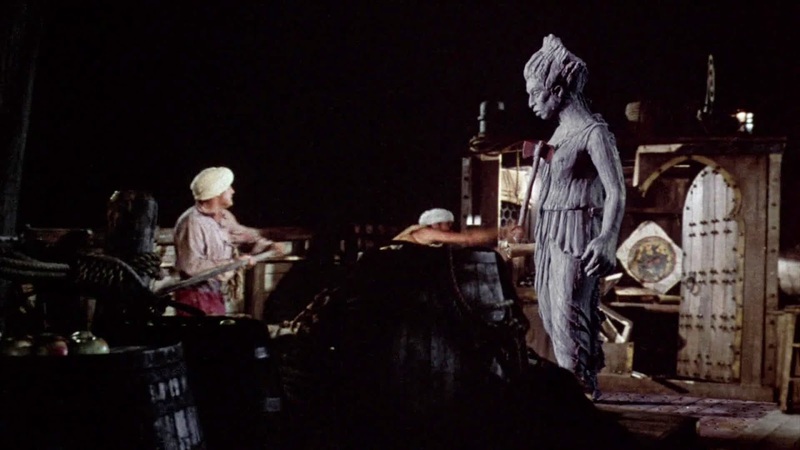 Apparently this model escaped the clutches of the demolition crew - which was Kubrick's mandate to stop any of his ships being reused in other films - and astonishingly Stanley donated said model in the 1970's to an artist or someone along those lines who was in no way connected to the film industry. There has been a degree of curiosity among those in the know as to whether the model is genuine, with the general consensus being that it is indeed the actual screen used model from the production. 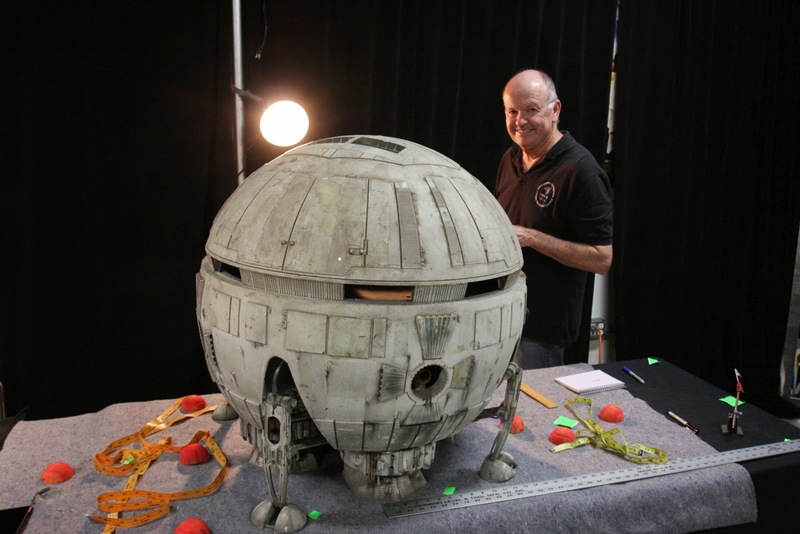 The miniature has been looked after for some 40 years and now has a permanent home, I believe at the museum of The Academy of Motion Picture Arts & Sciences. Stephen Perry of Peerless Optical sent me this wonderful image of one of the actual large format photographic cutouts of Aires mounted on glass. This mock up was used for the shots of Aires descending toward the moon's surface. 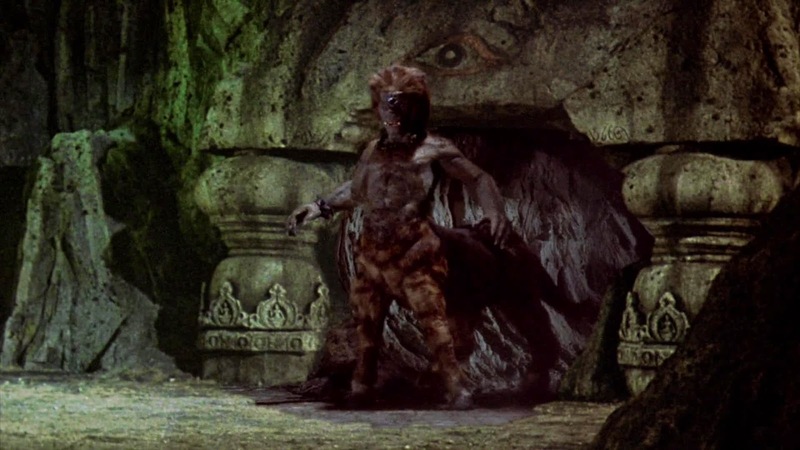 Also, before we move onto Ray Harryhausen, I'd like to take the opportunity to make mention of a most worthwhile service that until this week, I'd not been aware of! It's called The Optical, and founder Mark Boszko has put together a solid series of excellent podcasts in conjunction with Cinefex magazine whereby Mark and a variety of contributors, speak at length about the VFX and much more for specific movies covered by Cinefex in those very early, long out of print issues. 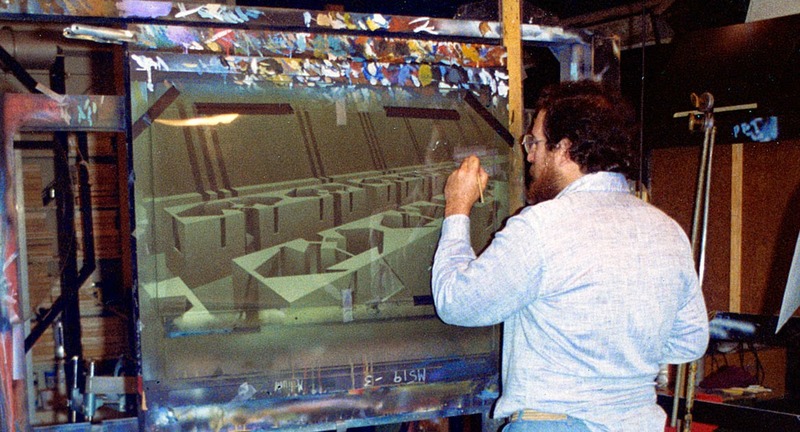 Matte artist Jesse Silver at work on a TRON background painting. Since Mark alerted me to this wonder of modern technology I've been bingeing on a whole gamut of terrific (and often amusing) MP3 Podcasts whilst painting seascapes. These aren't any mere 'puff piece' quick sound byte styled affairs but good solid 'feature length' in depth discussions that folks like me just love. Among the gems are an excellent TRON interview with Harrison Ellenshaw and animator John van Vleit (how the hell that picture was ever finished is beyond me... and beyond the interviewees too it would seem); an excellent study of pioneering sound designer Walter Murch; an interesting career discussion with matte painter Jesse Silver, and a hugely entertaining Don Shay discussion on Willis O'Brien, Kong and a whole slew of unmade projects, seemingly always about 'Lost Worlds' (!) Highly recommended... even if our moderator, with not so much as a hint of shame, admits up front to not liking 2001 or APOCALYPSE NOW (!) and to only ever seeing KING KONG or THE CONVERSATION in preparation for those podcasts!! Nevertheless, essential aural enlightenment! 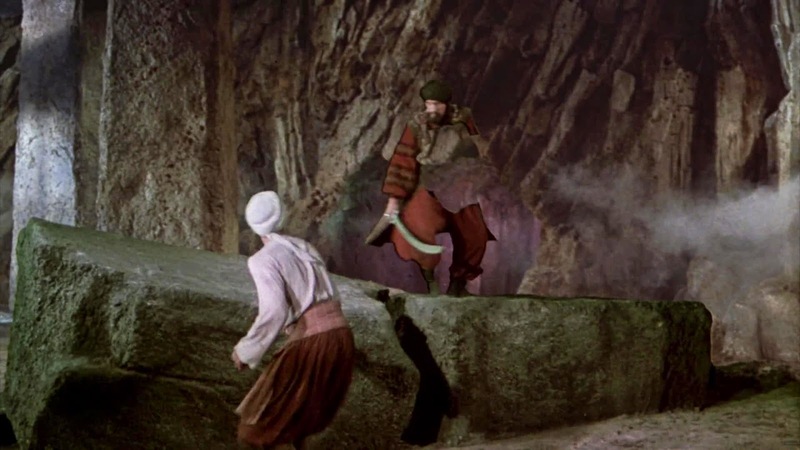 The maestro, Emilio Ruiz, dominated European special effects in matte shots and perspective tricks for decades. 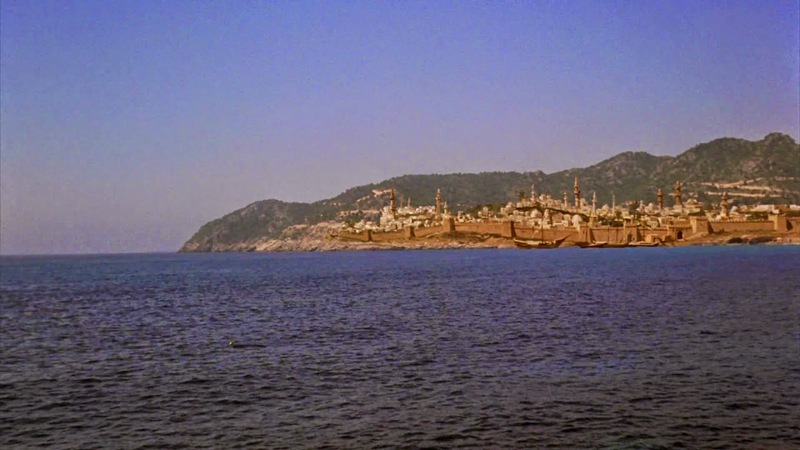 Finally, it's high time I reminded my readers of another great matte shot blog site: Movie Matte Painting is a most valuable resourse, run by Spanish effects man Domingo Lizcano, who's vast knowledge of Europe based matte and special effects people I know virtually nothing about has proven vital for researchers. 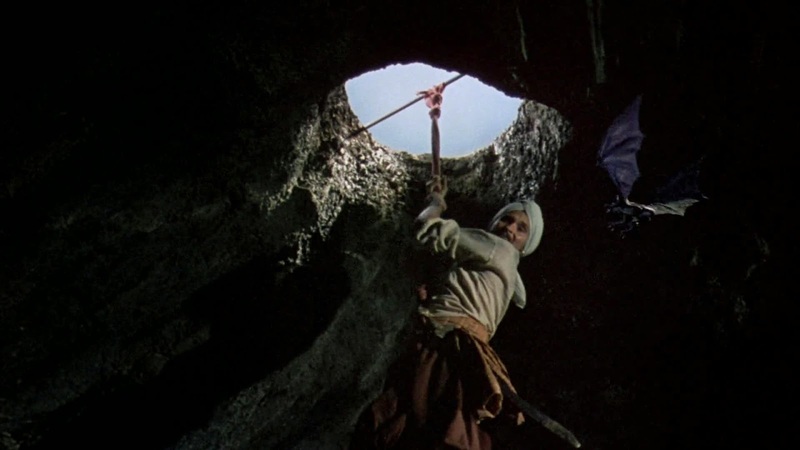 Domingo's latest blog gives us a superbly illustrated history of mattes and hanging miniatures in Spanish cinema throughout the past 70 odd years. 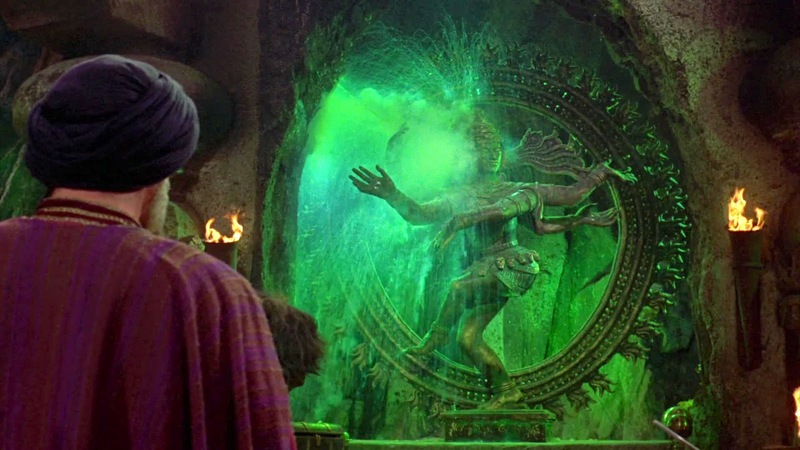 Domingo also has the long established virtual museum of traditional special effects website, Index FX which is mind boggling in it's level of research. 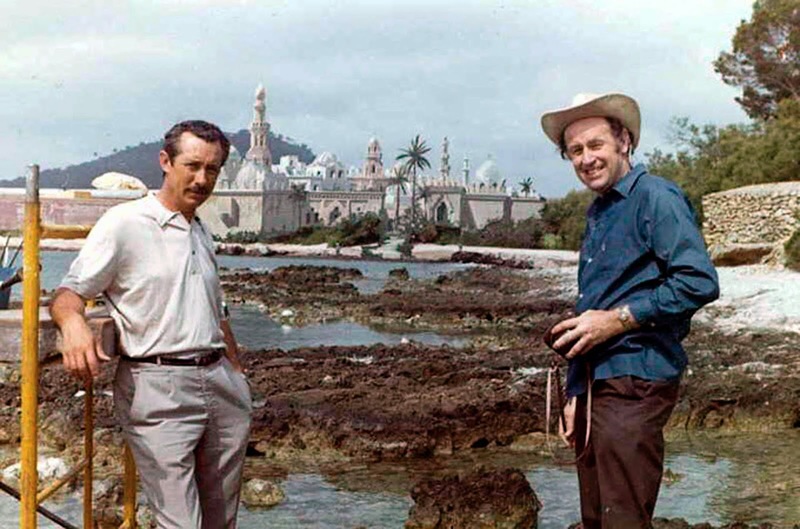 I envy Domingo as he has had the pleasure of working alongside of - and being friends with - one of my all time favourite matte painters and miniature magicians, the late, great Emilio Ruiz del Rio, of whom I've mentioned here many times, and in fact pops up in today's blogpost. Domingo has just completed a fully illustrated book (alas, in Spanish only) on all facets of special visual effects in the Spanish film industry, with many interviews with matte artists, make up designers, miniaturists and art directors. They really knew how to create a movie poster campaign back then. This glorious UK Quad Crown poster that promises a lot... and the film delivers. I've still got some of these posters from my days in film distribution. 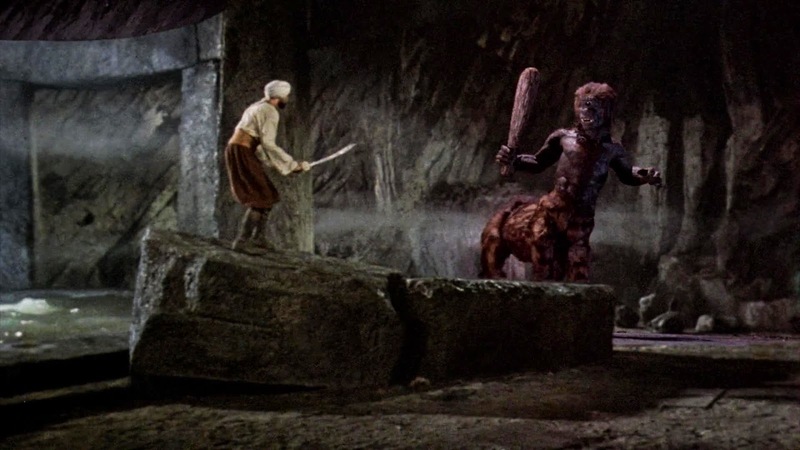 I've forever been a fan of the mythical lands, tales and monsters that originated from the imagination and hands of the late Ray Harryhausen. 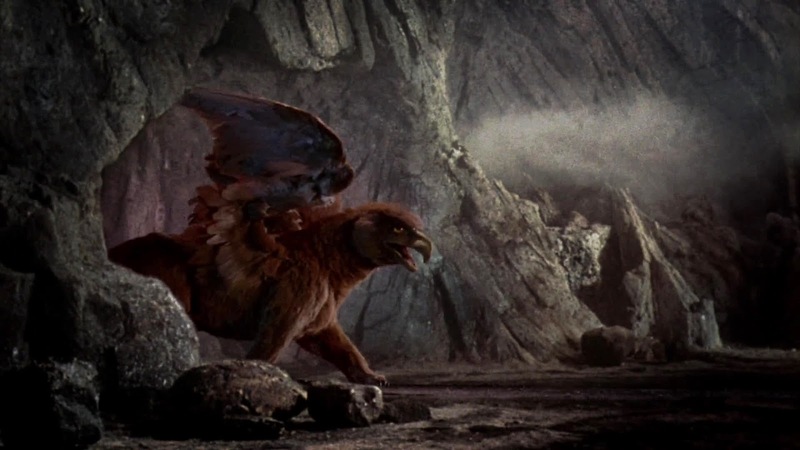 I remember seeing many of these films on the big cinema screen as a kid and teenager, with as best I can recall THE VALLEY OF GWANGI doubled with JASON AND THE ARGONAUTS, probably around 1970, being my first exposure to Ray's work. Oh man, I was hooked! It was extremely rare in those days here in New Zealand to see anything remotely along these lines on our single channel, monochromatic, state run tv, so kids like me would acquire 8mm digest versions of some of those great flicks such as 20 MILLION MILES TO EARTH and EARTH VS THE FLYING SAUCERS where, the best you could get usually was a 200 foot black and white silent print running around 7 minutes at best. Sometimes a 400 foot digest print, maybe even in colour, might show up and we'd run these things over and over, marvelling in the unthinkably fantastic visions before us. 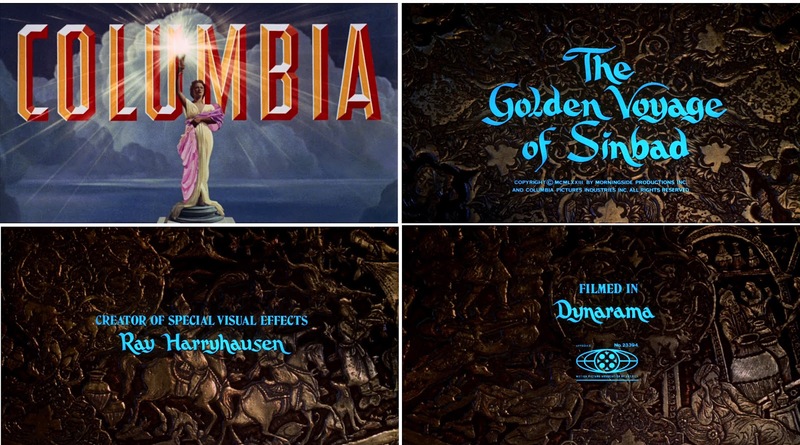 I was very fortunate in my first job straight out of high school in the mid seventies whereby I got to work for Columbia-Warner Film Distributors who, as luck would have it, distributed most of the Charles H.Schneer-Ray Harryhausen pictures. 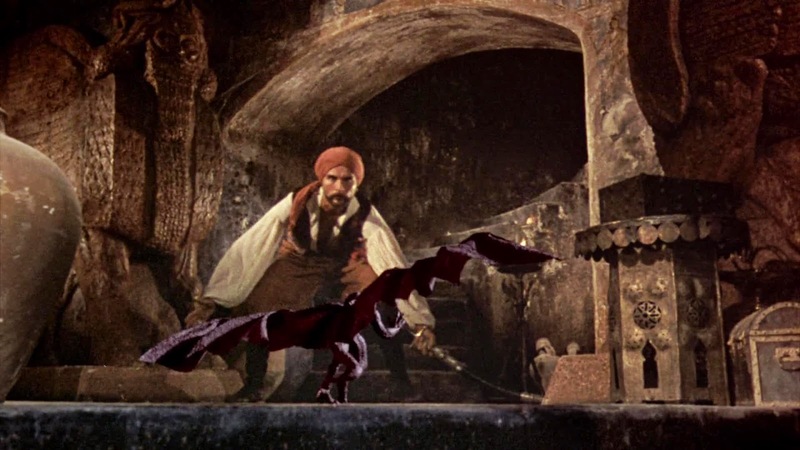 Being able to freely borrow as often as desired the16mm prints of all of the SINBAD films as well as other Harryhausen-Schneer Morningside productions was a dream come true. 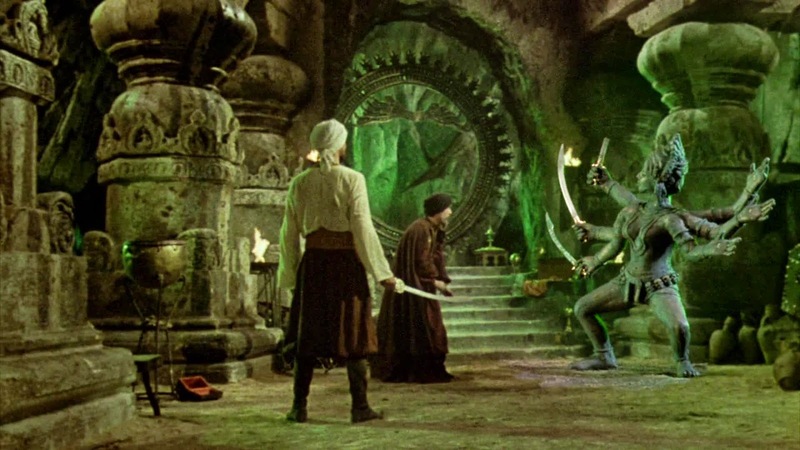 In today's blogpost I want to celebrate the least written about and sorely undervalued of all of Ray and Charles' fantasy films, THE GOLDEN VOYAGE OF SINBAD (1973) - a film that has been neglected and largely ignored by fans and authors alike for far too long for reasons which escape me. 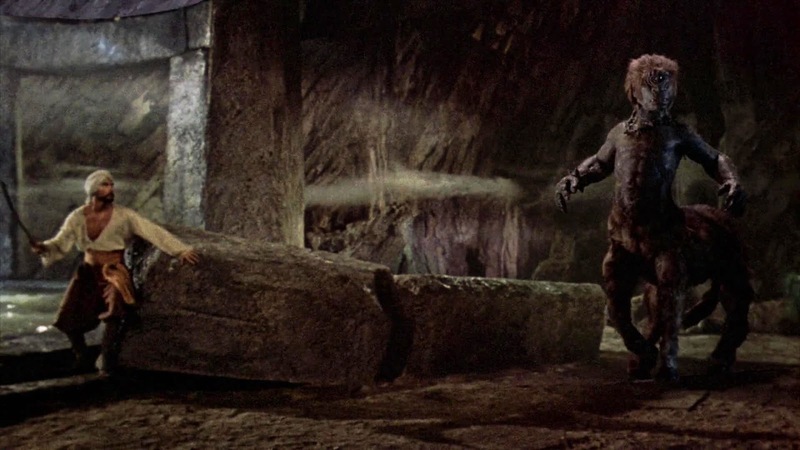 It's sometimes a tough choice when asked to pick one's favourite film from a given series, such as James Bond for example, with Harryhausen's catalogue being just such a thought provoking scenario to pick and choose. 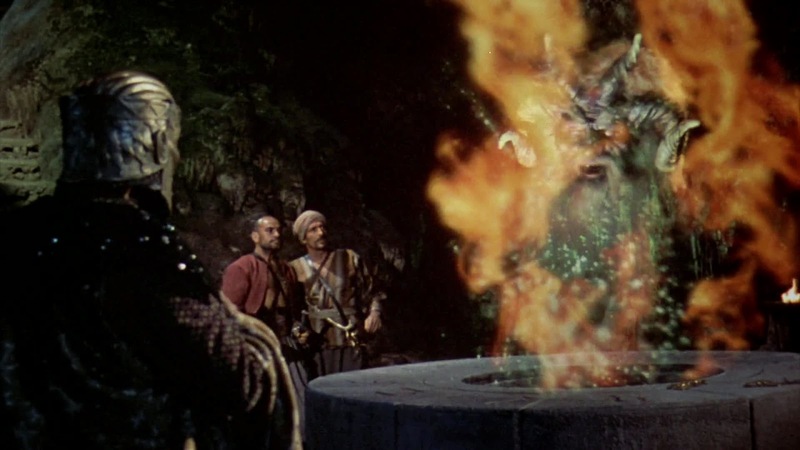 Well, I loved THE 7th VOYAGE OF SINBAD no question. 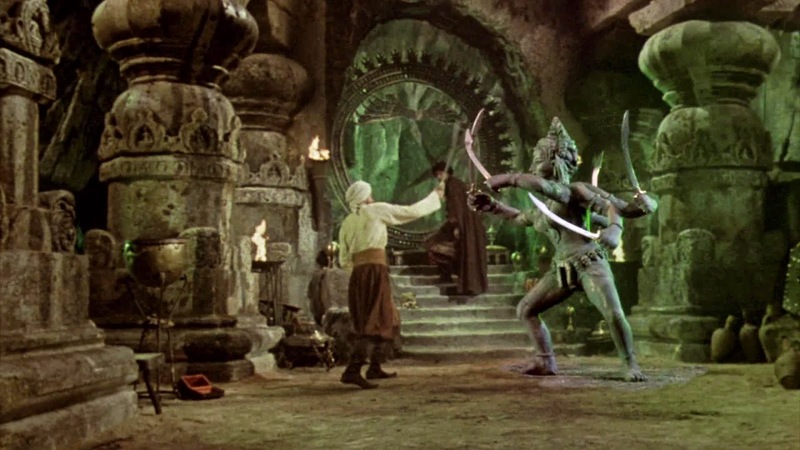 Great fantasy entertainment all the way and buoyed by a phenomenally good Bernard Herrmann score. 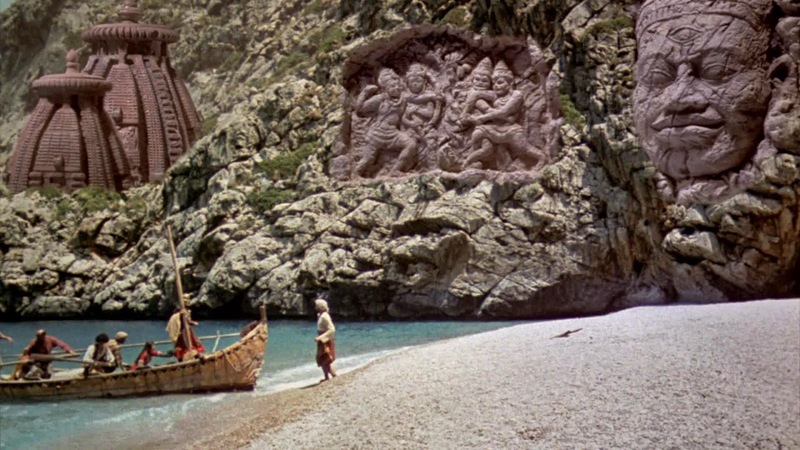 JASON AND THE ARGONAUTS features prominently on most fans lists, and as much as I like it, the film is not well paced and takes forever to pick up speed and get about the business, quite unlike 7th VOYAGE which hit the ground running. 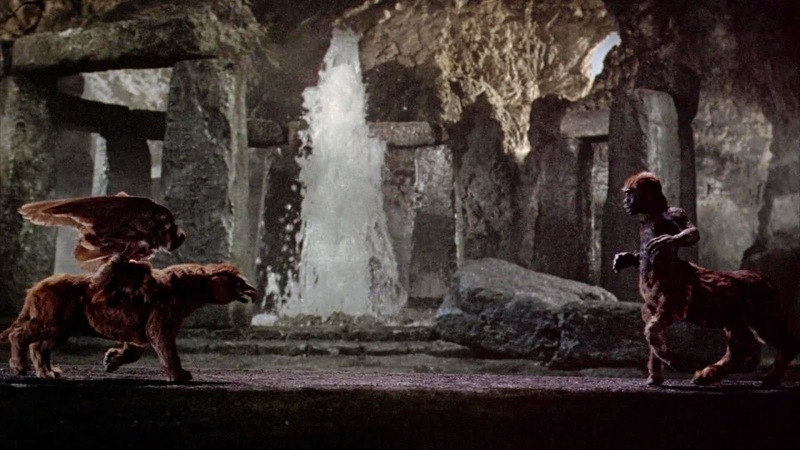 Of course JASON's skeletal swordfight climax was and remains utterly brilliant, though as Ray once said, it really should have taken place at night for maximum impact. 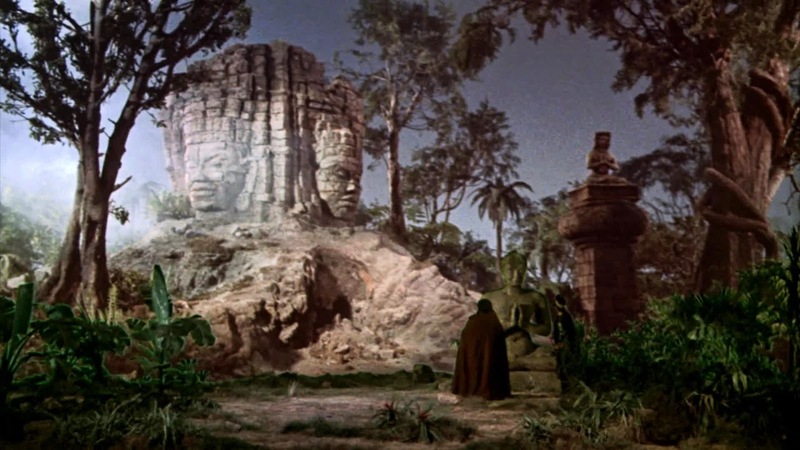 MYSTERIOUS ISLAND was great entertainment and THE FIRST MEN IN THE MOON was an interesting departure for the team from their usual formula, but it worked. 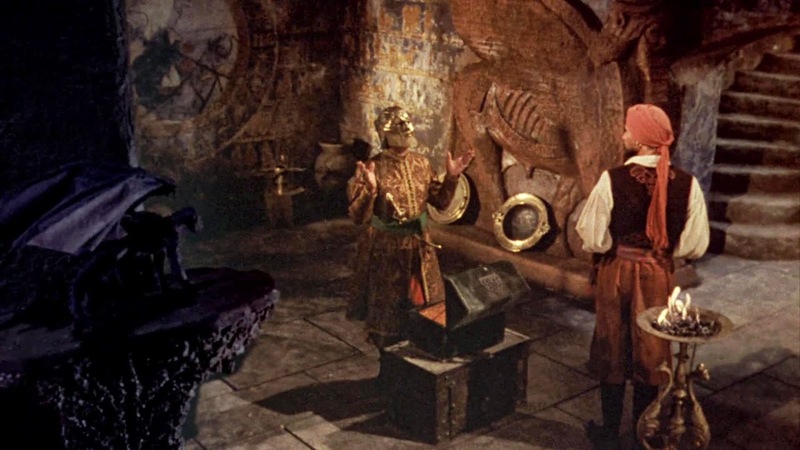 Today's feature, GOLDEN VOYAGE was Ray's last good film in my book. 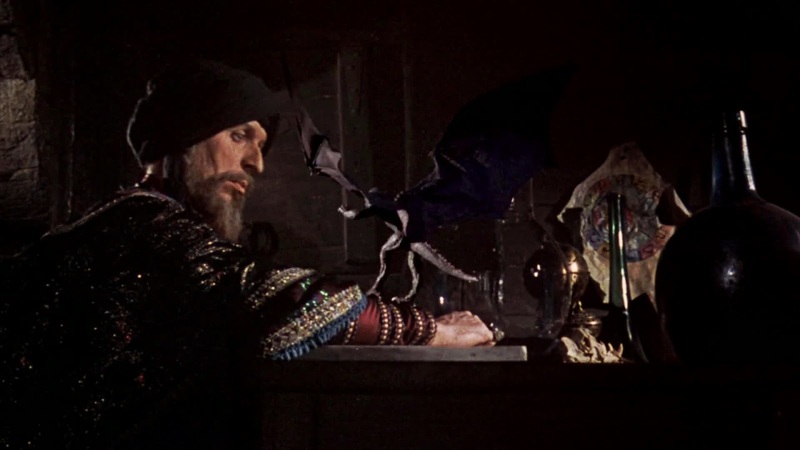 I disliked the dreary SINBAD AND THE EYE OF THE TIGER which failed in every capacity. 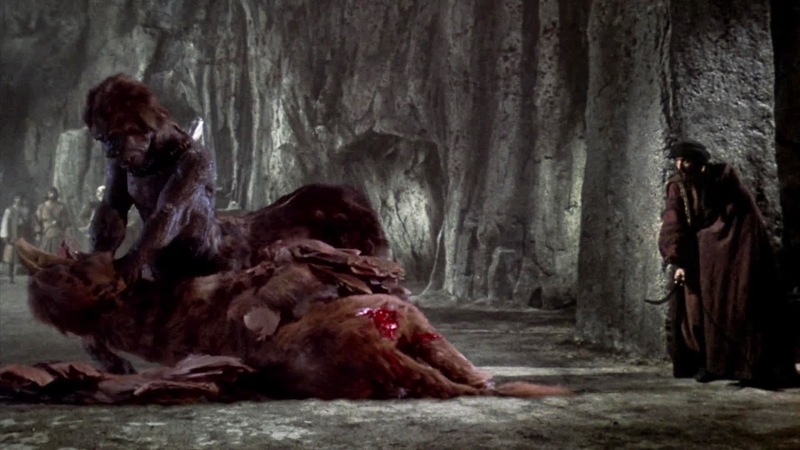 Not even Ray's Dynamation stood true, with poor process and travelling matte work and grainy effects footage, not to mention a lethargic pace and uninvolving narrative. 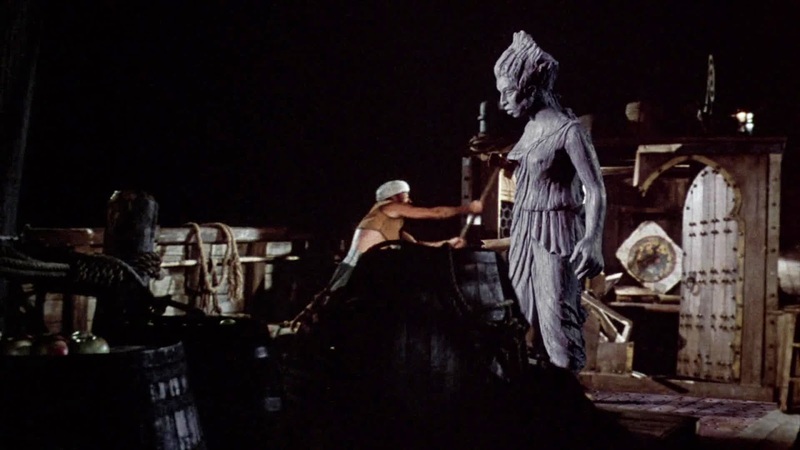 Sadly, much the same could arguably be said of the final Schneer-Harryhausen picture, CLASH OF THE TITANS which again left me cold. 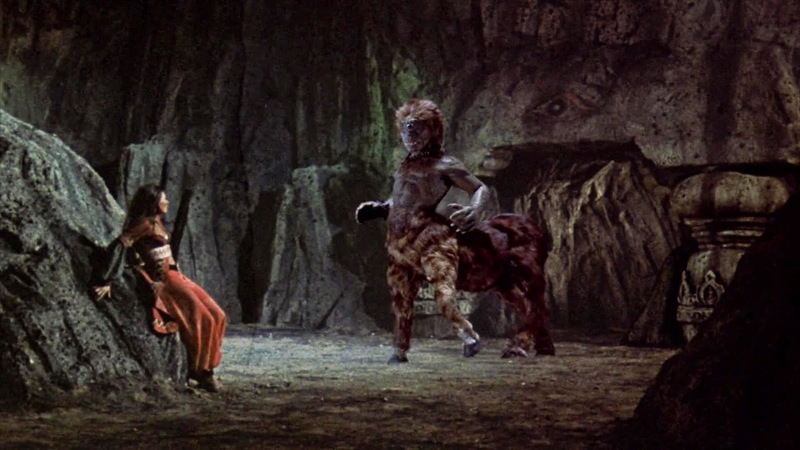 For my money, GOLDEN VOYAGE truly stands out on many levels and absolutely lives up to expectations. 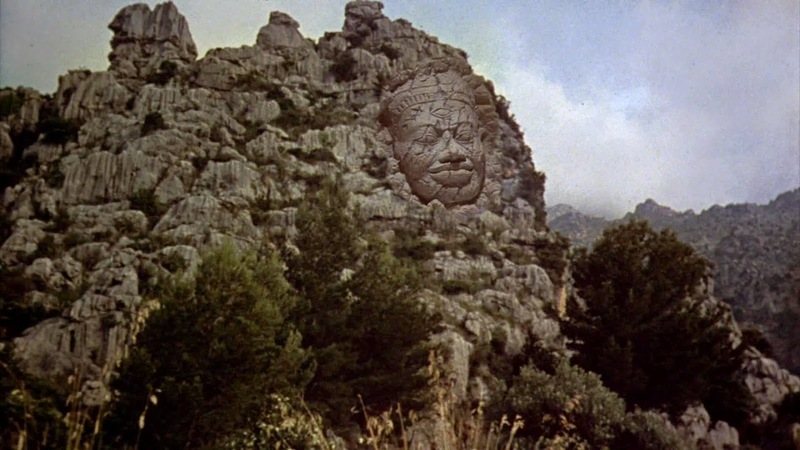 The scenario is solid - the search for missing fragments of a mythical amulet - with the film kicking off to a rousing start right from frame one. Gordon Hessler's direction is right on the money and he shows a natural insight with the genre. 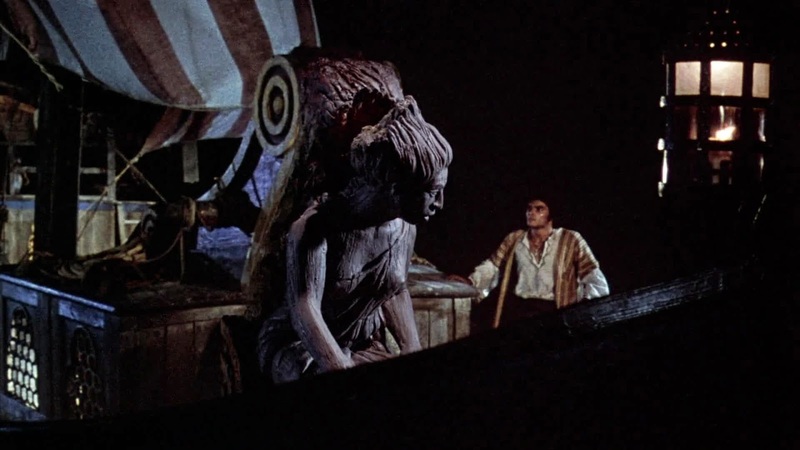 While the composer Miklos Rozsa was not quite Bernard Herrmann in terms of larger than life fantasy themed compositions, he was occasionally excellent as proven on many projects, with BEN HUR being the most noteworthy by far, and while it's not as strong a musical motif as 7th VOYAGE (the best Harryhausen film in musical terms with not just the main theme but the one on one skeleton sword fight having the most unique musical cues ever committed to a movie soundtrack) for this film Rozsa composes a memorable opening theme which compliments the wonderful hand lettered title cards. 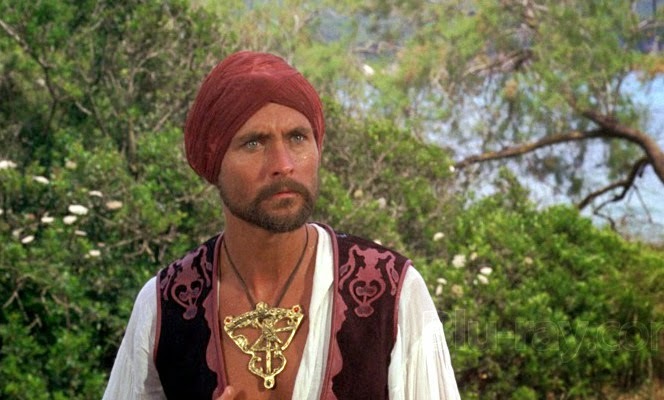 The casts of the various RH-CS films are often interesting, and I while think Kerwin Matthews proved a great Sinbad in 7th VOYAGE, John Phillip Law takes to the role here with gusto and charisma. 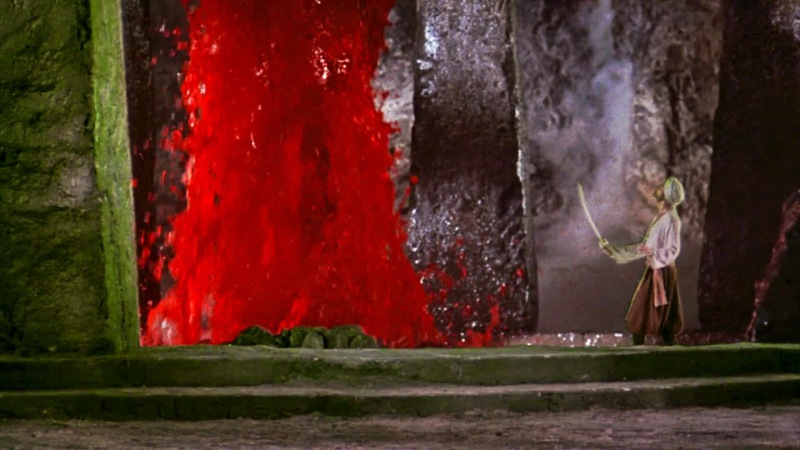 I really liked Law in Mario Bava's deliriously wacky DANGER DIABOLIK (1968) and feel he was always under rated. DR WHO's Tom Baker makes for an especially malevolent villain and contributes more layers to his character than one might usually expect in such fare. Leading lady Caroline Munro is certainly easy on the eye (as was the stunning Kathryn Grant in 7th VOYAGE), though, as with the majority of her film work, she's given precious little to do. For British/New Zealand and Australian audiences, co-star Martin Shaw was very popular in the excellent UK action series THE PROFESSIONALS a few years later. I don't know if that ever played in the USA? Interestingly, as best I can recall GOLDEN VOYAGE's screenwriter Brian Clemens also created the above named hit tv series. 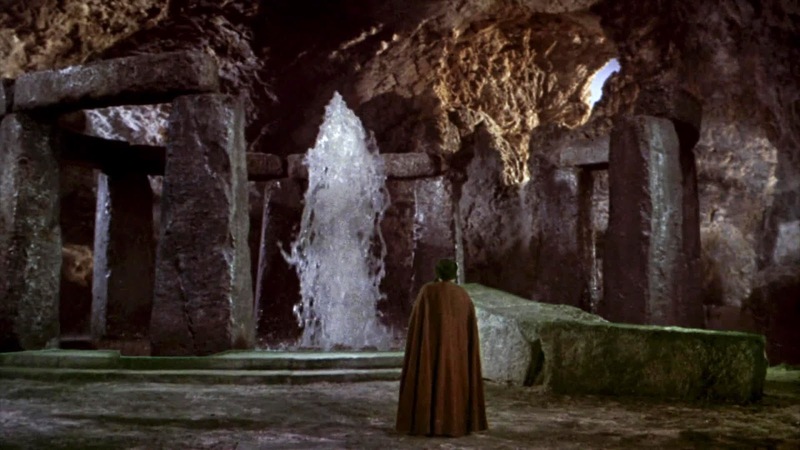 I've always liked the production design of GOLDEN VOYAGE, with Fernando Gonzalez' interiors of The Fountain of Destiny being especially memorable from when I first saw this on theatrical release in 1973 at the grand old (now long demolished) Embassy theatre in downtown Auckland. 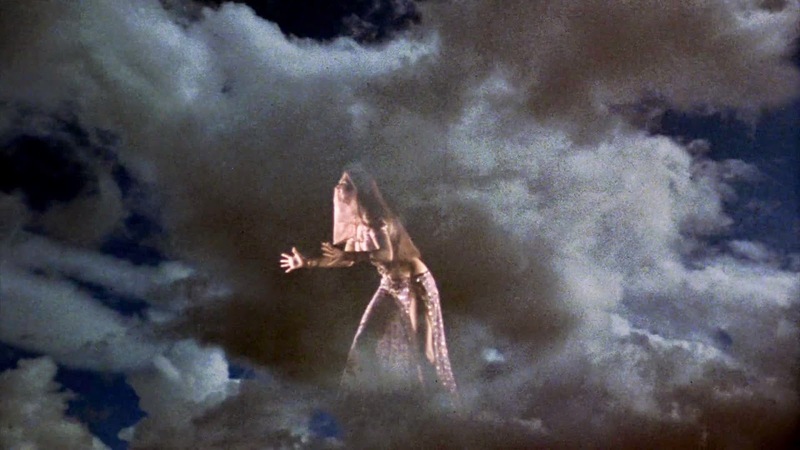 Ted Moore's vivid, heavily saturated cinematography with strong reliance on gels and deep shadow contributed much as well. I'm a big follower of great sound fx editing in movies and certain films stick in my mind from as diverse a collection as you'd ever imagine - ENTER THE DRAGON, ALIEN, KING KONG, STAR WARS and GOLDEN VOYAGE OF SINBAD being among my all time favourites (yeah, hey guys, no joke... the Bruce Lee flick really is and sounds something else, though as usual, I digress!) 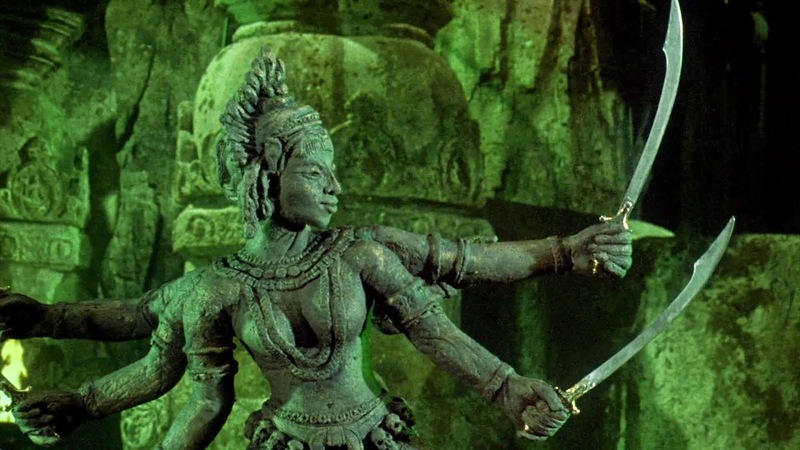 Some really nice sound cutting here, especially with the Kali set piece where the six swords unsheath. Being a visual effects blog I naturally cannot exclude the trick photography angle from this summary. 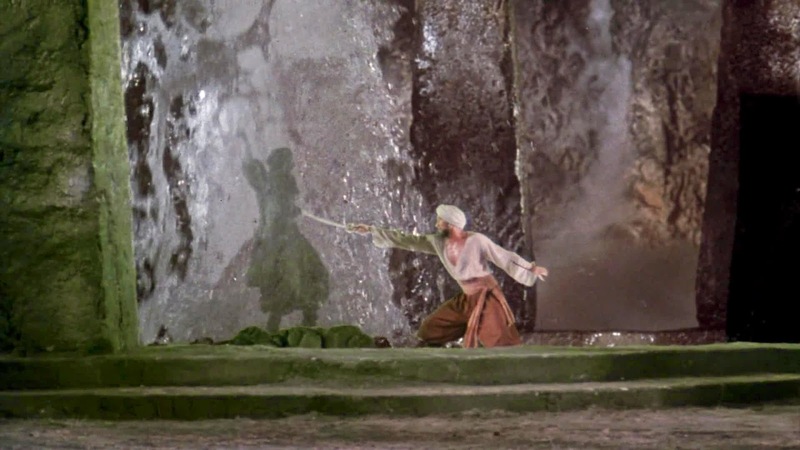 To encapsulate it, GOLDEN VOYAGE is, in my humble opinion, Ray's best visual effects work ever, period! 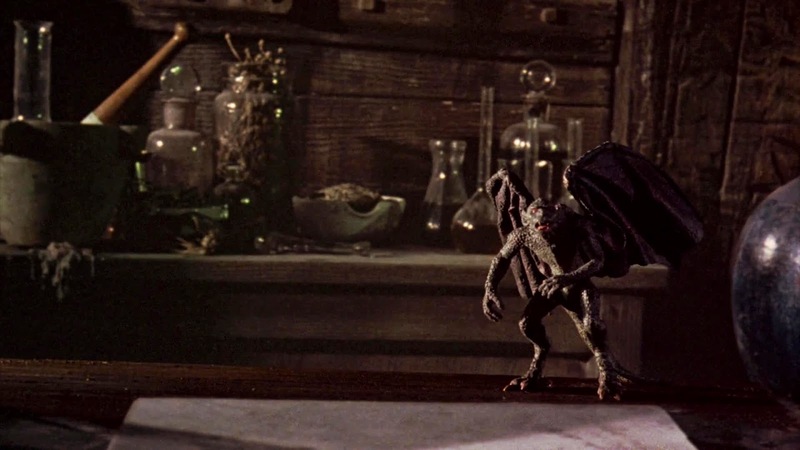 I can't think of a single RH film where the stop motion has been as well executed. It really looks exceptional. 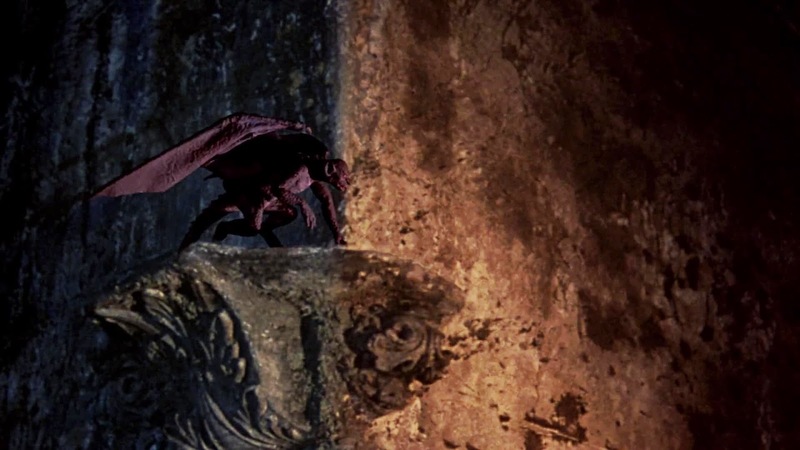 Now I know there will be some (or many) who will disagree as we all have our own particular favourites, but the film really does stand apart from the bulk of the Harryhausen work, especially the colour films where Ray's trick shots were somewhat more difficult to control. I've watched this film in all formats over the years in 35mm, 16mm, TV, VHS and now BluRay and it has always impressed me. 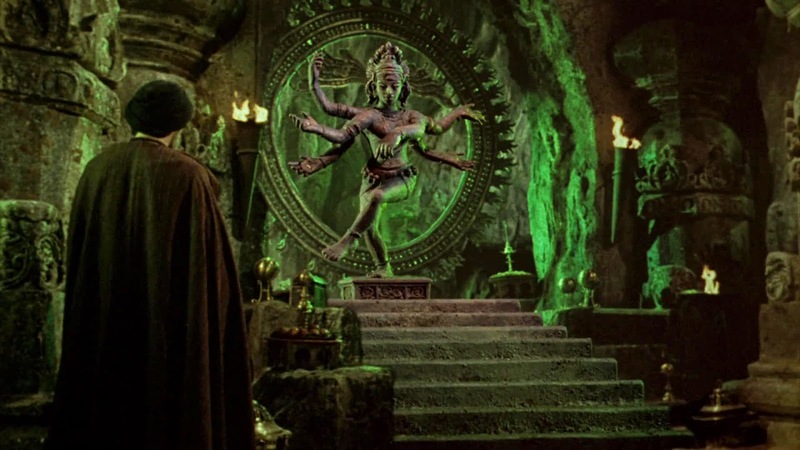 The very nature of Ray's Dynarama process necessitated rephotographing rear projected 35mm process screen footage, with the stop motion elements sandwiched into the process plate via split screens. This was all very well and good with Ray's earlier black & white shows where tolerances were more forgiving and monochromatic process shots were generally less visible than colour work. 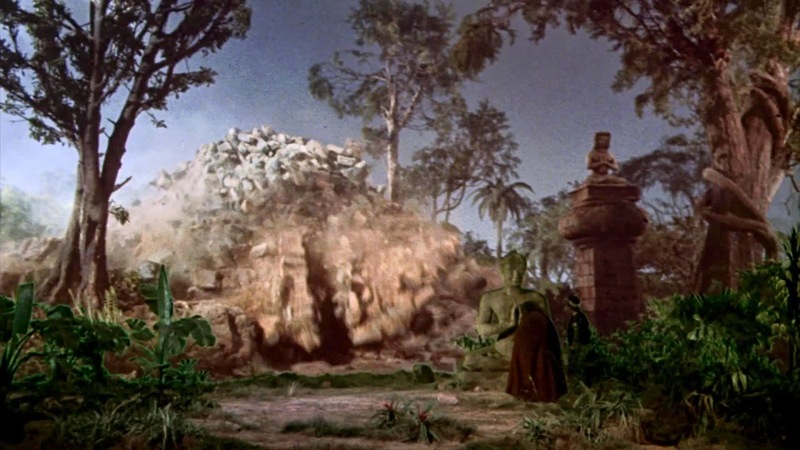 Ray had ongoing issues in many of his colour productions where colour fluctuations and often quite radical shifts in hues between cuts were like a poke in the eye with a sharp stick to the viewer, no more so than in VALLEY OF GWANGI where the beast constantly changed hue from shot to shot in a very disturbing fashion. 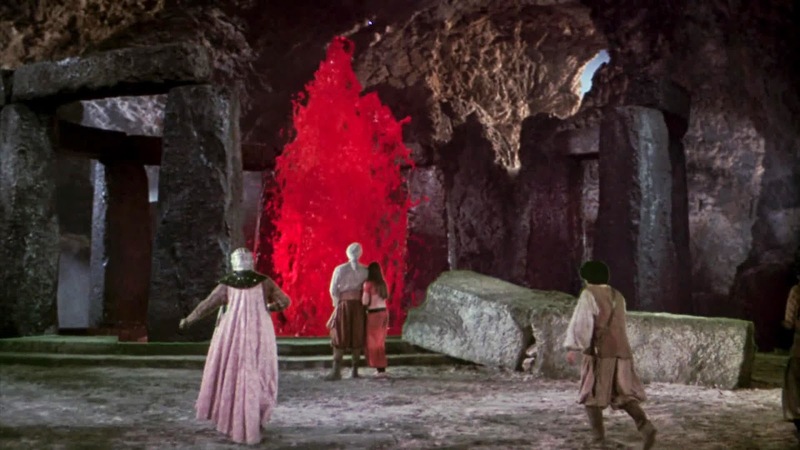 These photochemical artifacts were reportedly unavoidable due to crushing time constraints where Ray simply couldn't process tests and was at the mercy of Technicolor or whatever laboratory was handling the processing and printing. GOLDEN VOYAGE to my eye has always had Ray's most evenly balanced of all his colour Dynarama process shots where colour shifts were minimal or non-existent. 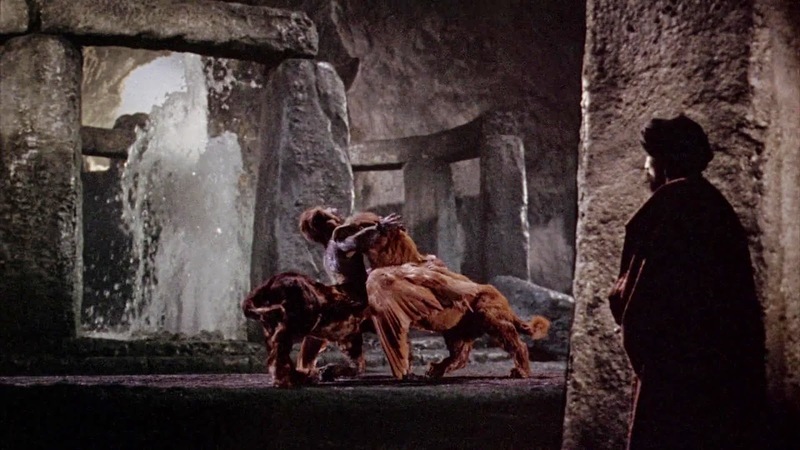 Some of Ray's films had ghastly amounts of unavoidable grain in the miniature process animation composites - again an artifact that seems to go with the territory with even JASON AND THE ARGONAUTS displaying heavy grain in the animation set ups. 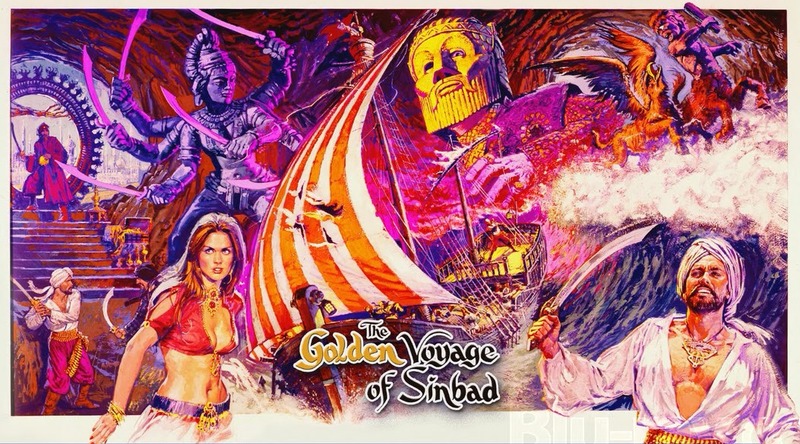 SINBAD AND THE EYE OF THE TIGER I recall as looking especially murky and unattractive, with hot spot, illumination fall off and grain for Africa. 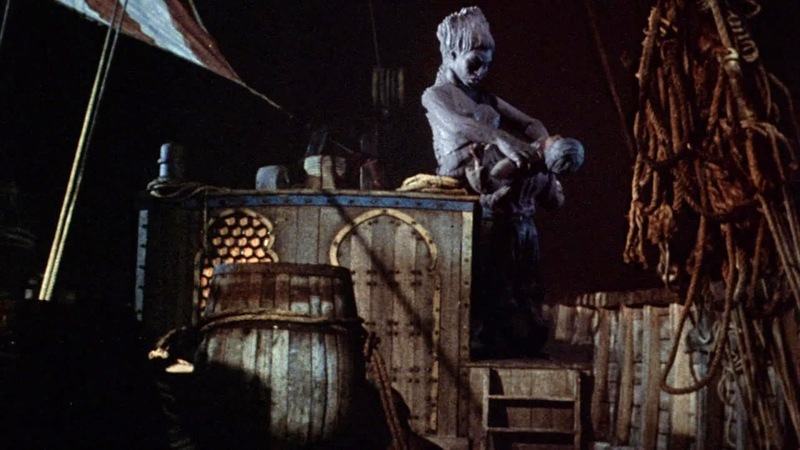 For some reason, GOLDEN VOYAGE looked surprisingly clean with all of the stop motion being carefully lit and extremely well balanced in all previous versions and is particularly noteworthy, if not spectacular as a superb BluRay transfer. In closing, GOLDEN VOYAGE succeeds too in the other special photographic effects work, with outstanding and substantial blue backing travelling matte work with performers working in front of giant blue screens and the final composites assembled by veteran Vic Margutti (and possibly Roy Field) at Rank in London. For the time, these blue screen shots really look phenomenal for the most part, with some shots impossible to detect as travelling mattes (unlike the immediate sequel which had very poor blue screen work). 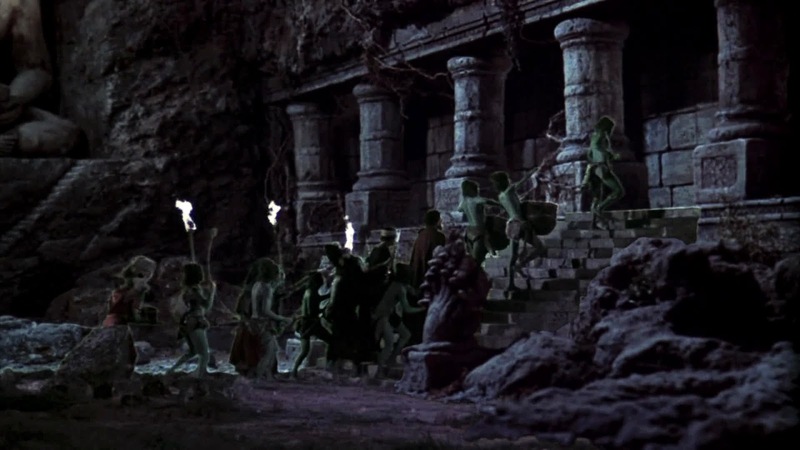 Frequent Harryhausen collaborator Wilkie Cooper was on board, uncredited, as miniatures cameraman and I absolutely must mention the work of the late, great matte artist Emilio Ruiz who provided the film with three invisible matte paintings that Harryhausen was reportedly very enthusiastic about. 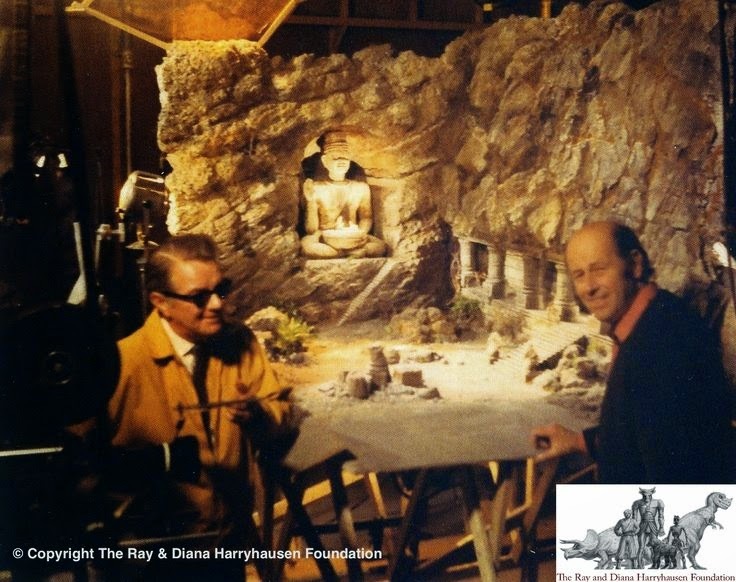 Producer Charles H.Schneer and Ray Harryhausen on the GOLDEN VOYAGE set in 1973. So, let us now take another look at a long neglected classic... or for those who've never seen it, do yourself a favour and actually watch it. They don't make 'em like this any more, sadly. I'm told that Ray had one of these copper (or brass?) title backgrounds framed in his London home. 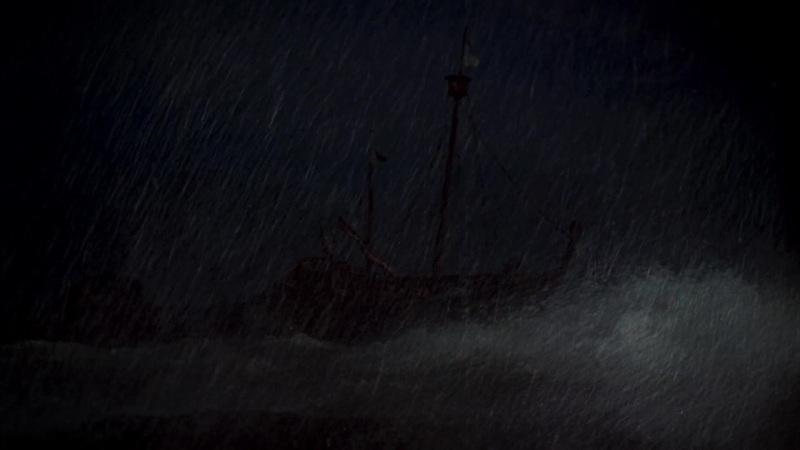 The opening storm. Not sure if it was created for this film or stock footage? 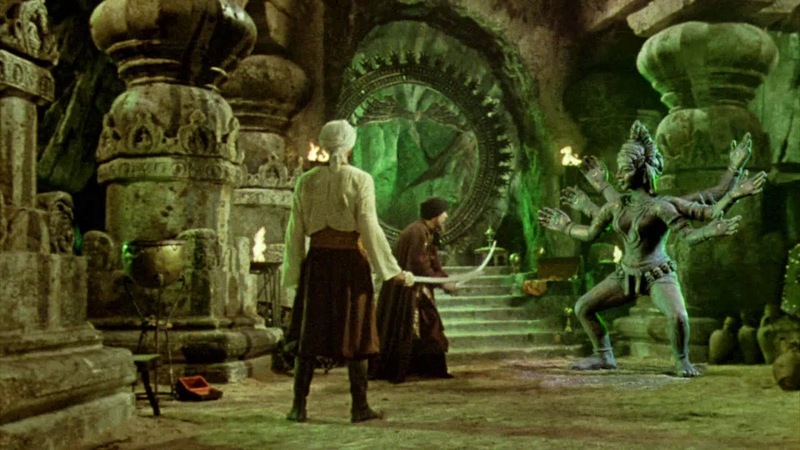 Caroline Munro appears early on in an extended fx montage sequence assembled on the optical printer. 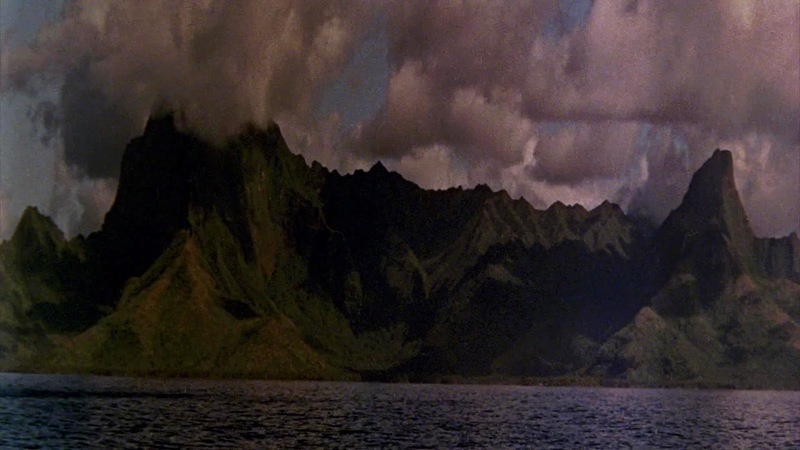 The first of three Emilio Ruiz matte paintings offers this flawless establishing shot to great effect. 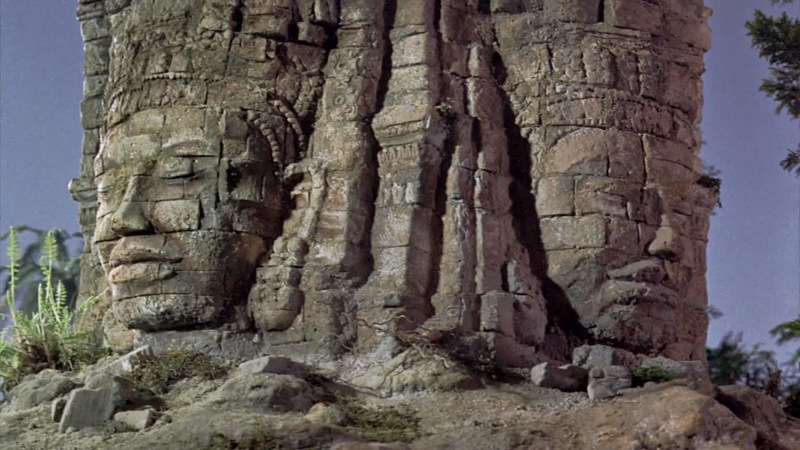 A short time into the picture and we are treated to another glorious Ruiz matte painting - and one of my all time favourites. 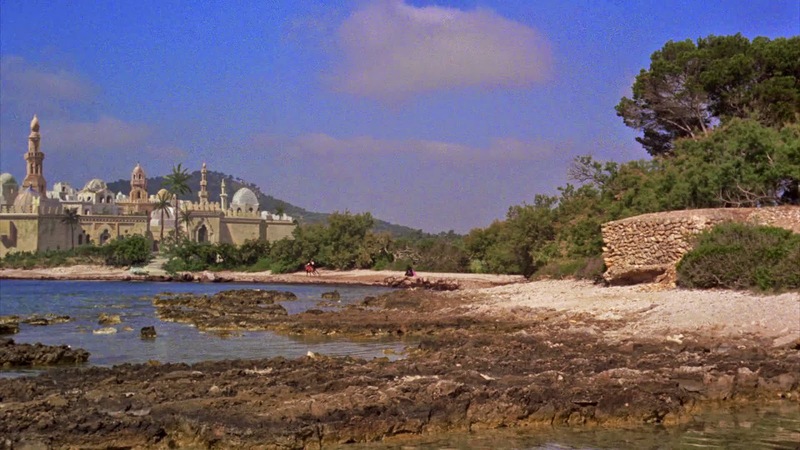 The shot starts in on a rider on the beach and pans smoothly across to reveal the walled city. 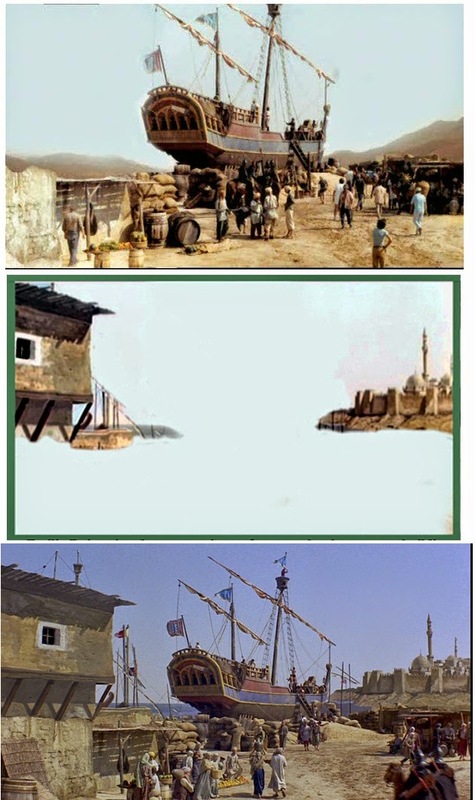 The painting was executed in the method long favoured by matte artist Emilio Ruiz whereby he would carefully paint the desired scene on location onto a sheet of aluminium, which would then be cut out and mounted 'in camera' as a foreground painting, allowing the effect to be photographed 'as is' on original negative. Stunning in it's simplicity. Emilio Ruiz del Rio and his foreground painting carefully lined up for Ray's camera. *Thanks to Ernie Farino for sending me this photo. 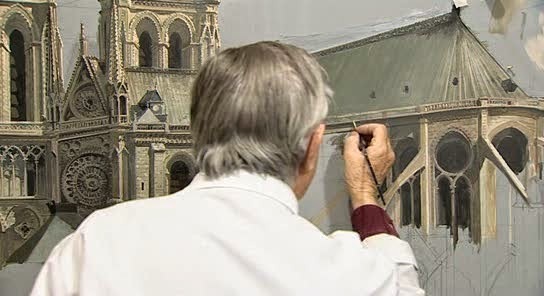 Ruiz shown here putting finishing touches on the matte art. 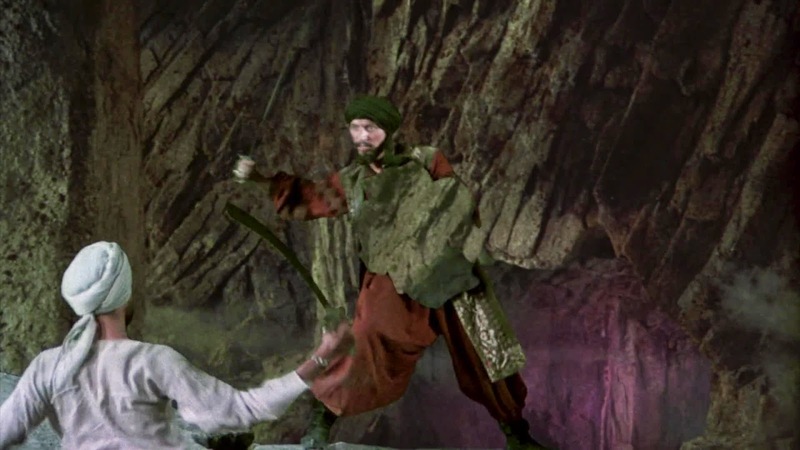 The Grand Vizier meets with Sinbad, though an unannounced animated intruder is also present. The Homunculus - the agent of Koura... not a nice guy. 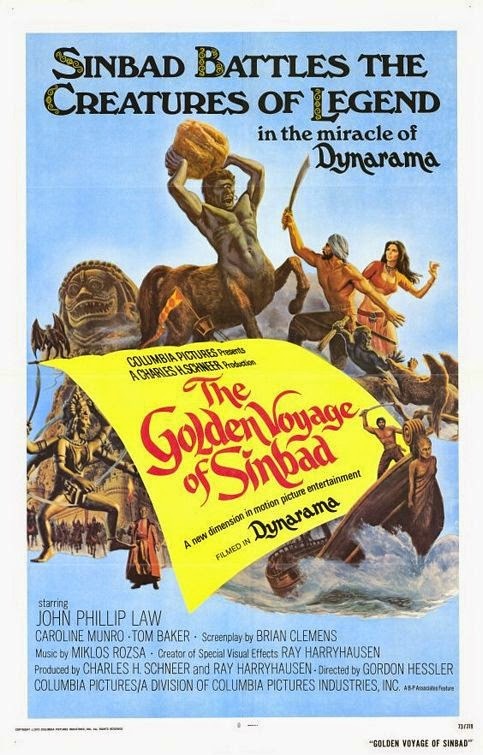 Sinbad spots the spy and through Dynarama, takes action. 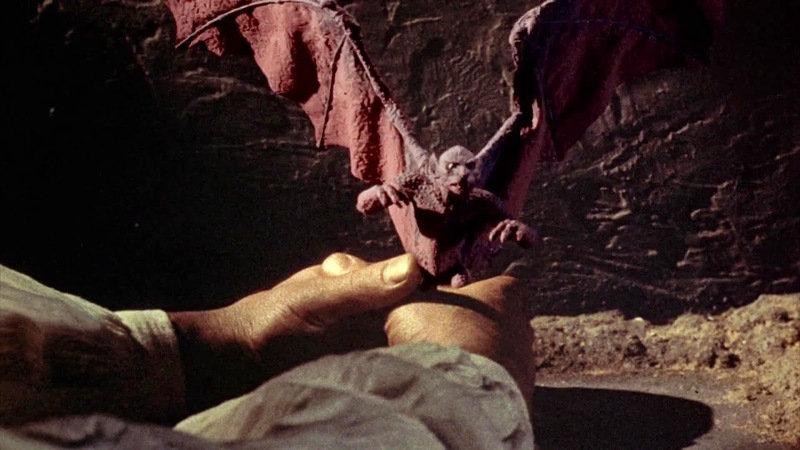 Ray's stop motion throughout the film is superb, and I feel it's his smoothest and most intuitive. FX composite where captured Homunculi goes up in smoke. 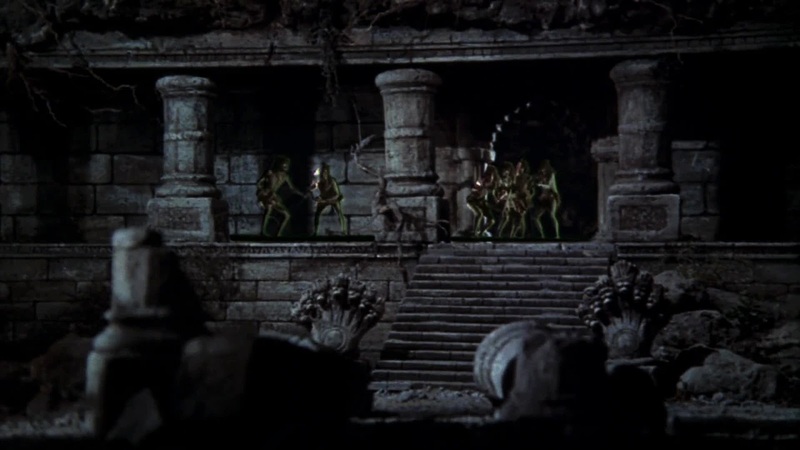 The third of the three matte shots in the film, again executed by Emilio Ruiz on a minimal exterior set. 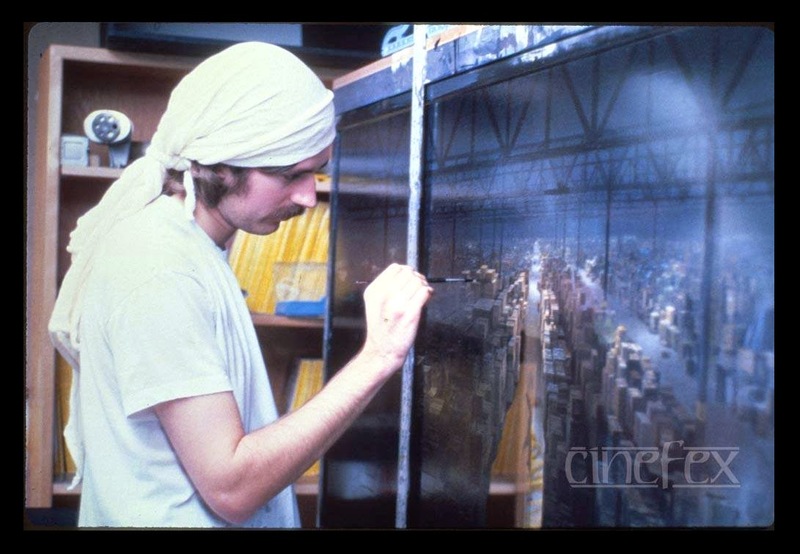 Ruiz with the foreground matte art comprising the nearest buildings as well as the entire distant city and landscape. 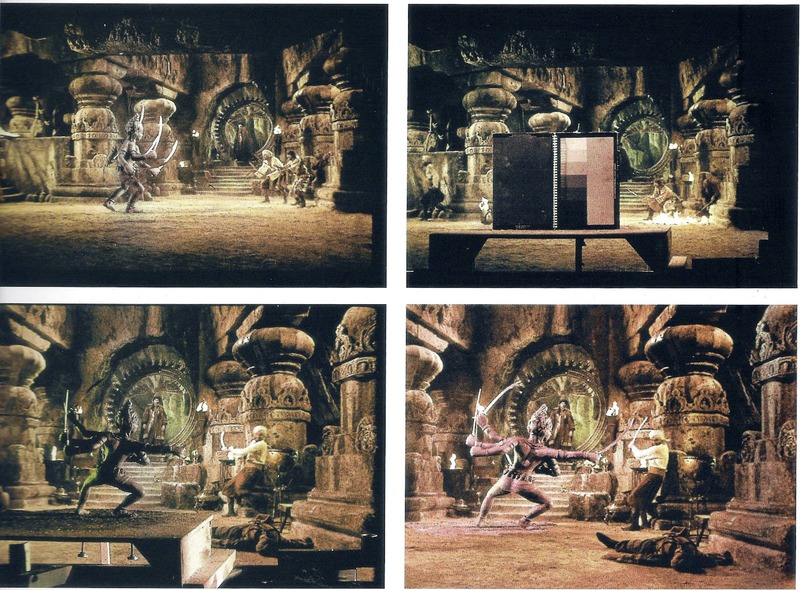 The Ruiz matte shot breakdown. Pure magic that goes with experience and an instinctive 'eye'. 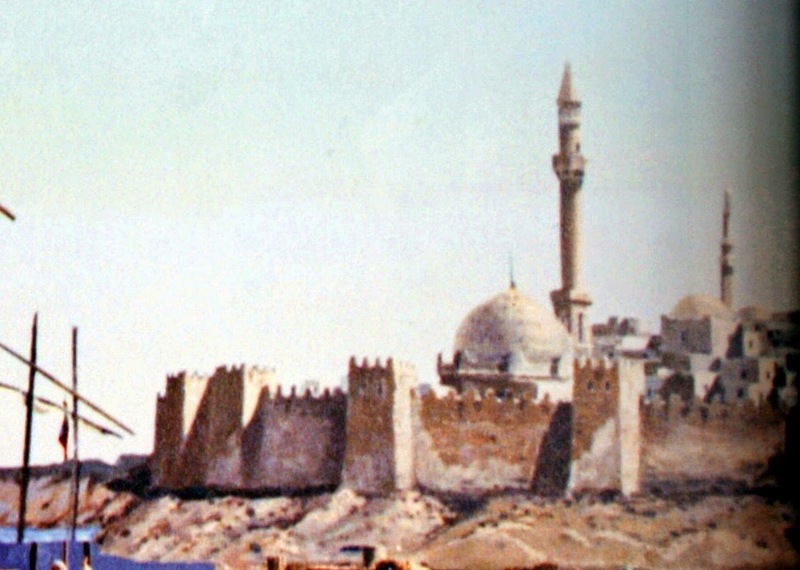 Detail from the painted matte art. Caroline Munro also made a similar impression in the excellent 007 picture THE SPY WHO LOVED ME a few years later. Now, here's a great example of Ray's Dynarama process where elements are balanced and blended so well as the ship's masthead figure comes to life and causes mayhem. Excellent sequence where Ray has actually achieved a feel of splintering timber as the wooden masthead moves about. 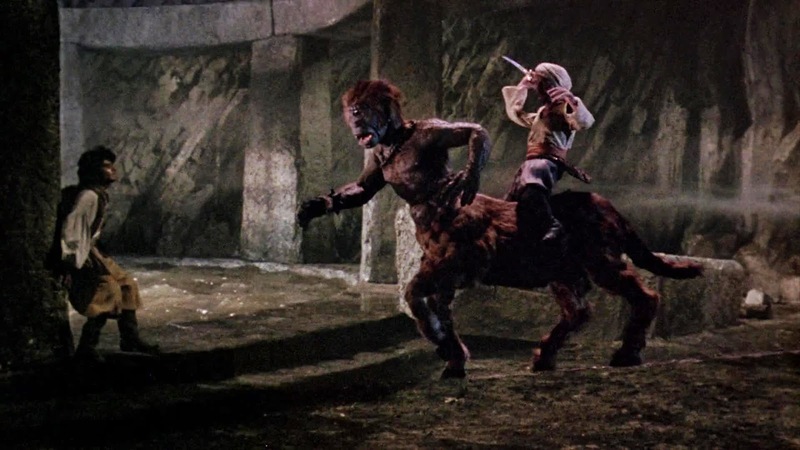 Tom Baker as Koura giving it his all in controlling the masthead figure. 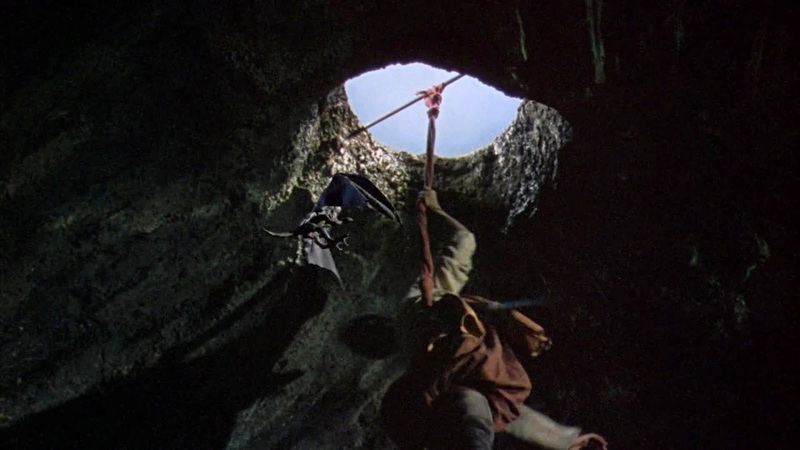 ...and a second whack results in an invisible switch where actual axe is replaced by a miniature stop motion axe which the masthead reacts to. Beautiful work Ray. "I don't know what it is...but it's weird and pissed off whatever it is." Superb integration between miming actors and animated figure. I love this sequence. The creation of an evil ambassador. 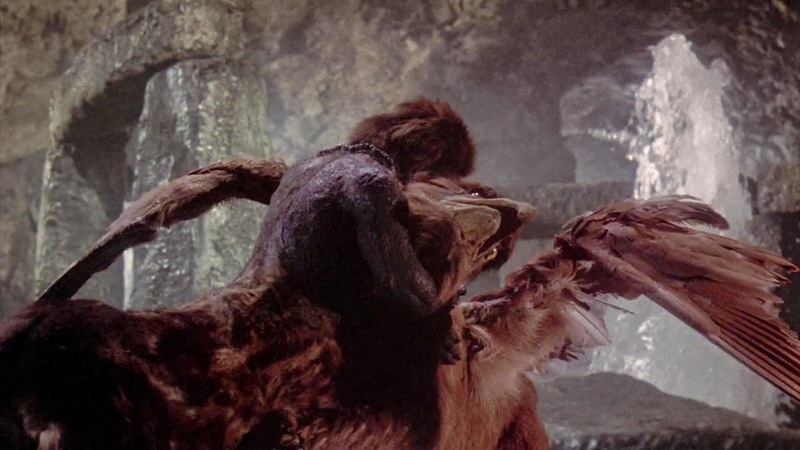 Exquisite and subtle stop motion work here. Koura and Homunculi: "well, what I can offer you is an excellent dental plan." 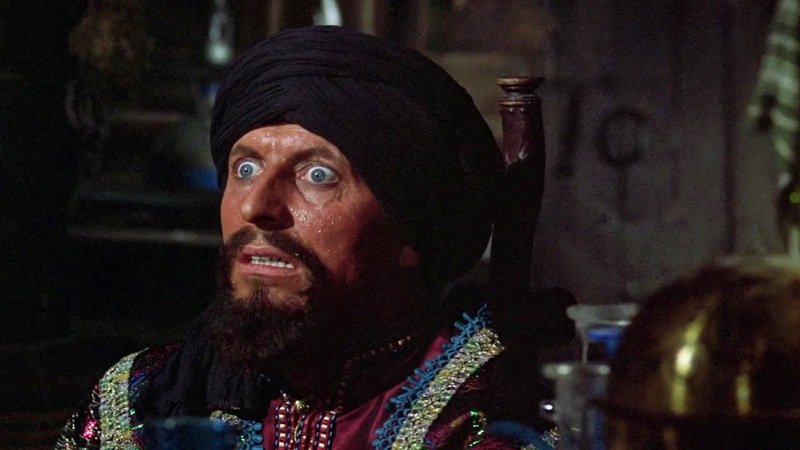 Tom Baker is perfectly cast in this film. I'm sure this is a stock shot from another show. 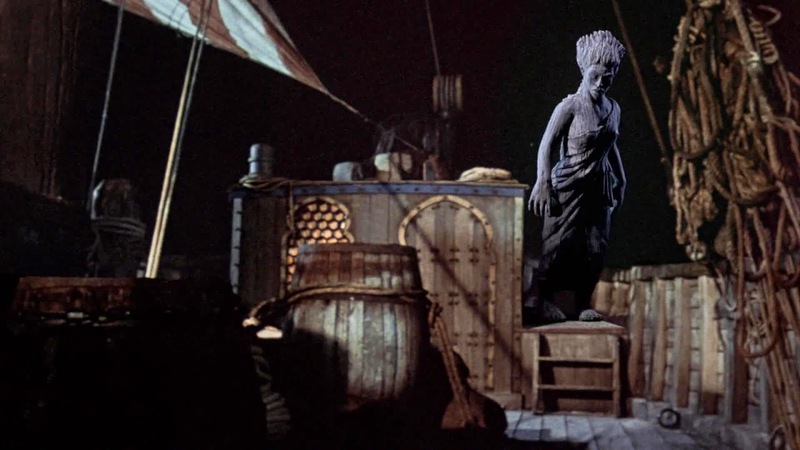 It's squeezed anamorphic for one thing, and I think it may be from MUTINY ON THE BOUNTY? 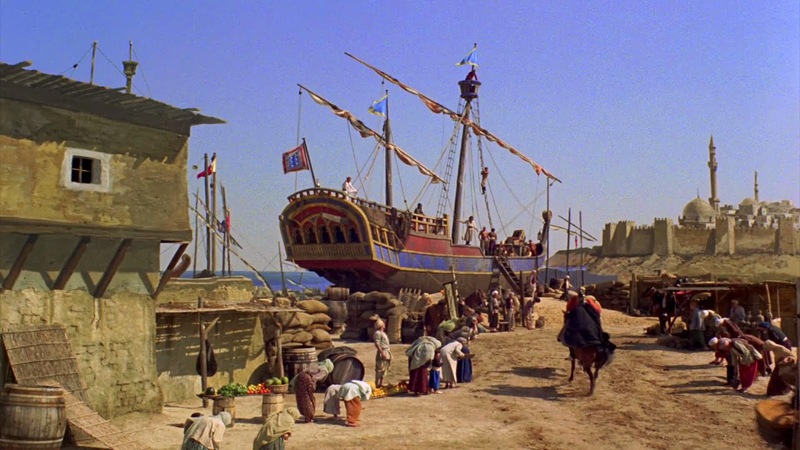 Charles Schneer was never afraid of packing in stock shots in his films. Arrival on the island. 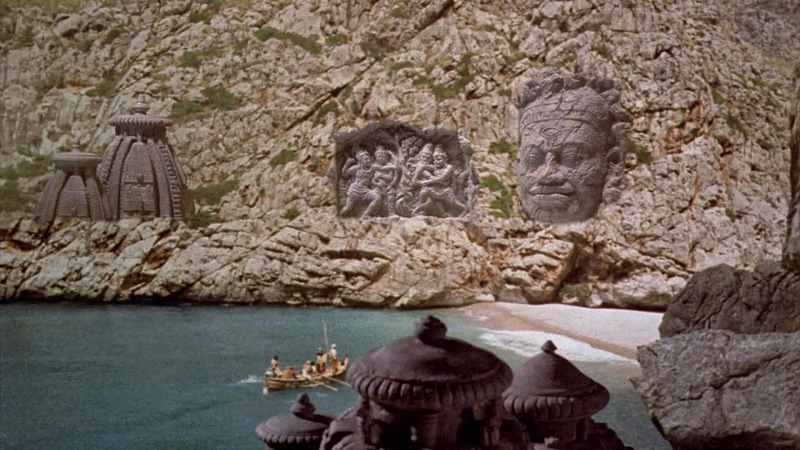 Actual Spanish location augmented with matted in miniature temples and stone figures. A follow up shot also with matted in miniature elements. More location topped up with matted model temples. More of the same which is surprisingly effective here. Arrival at the sacred temple. 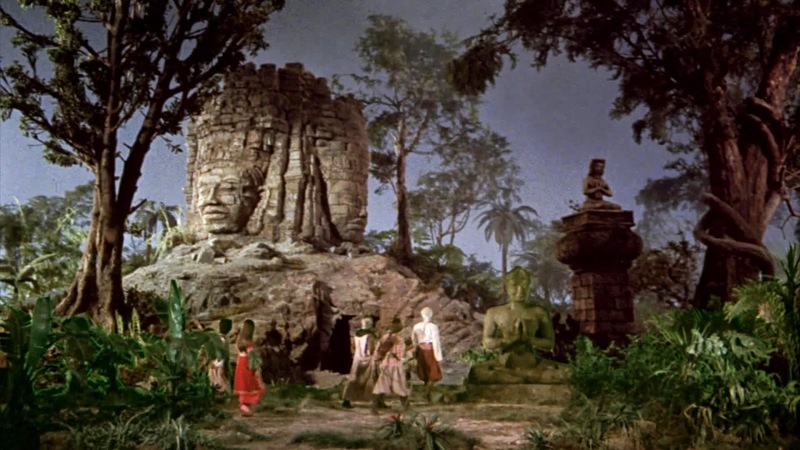 An entirely miniature set (everything) with just the actors and some close foliage added in very cleanly by blue backing travelling matte. 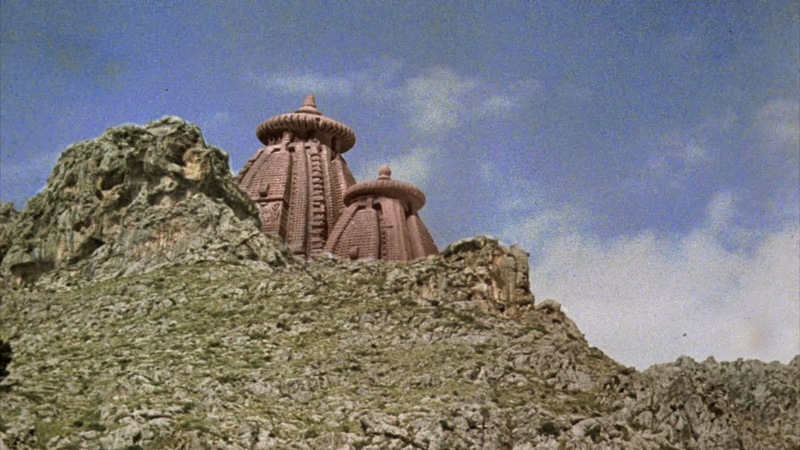 I think for memory the temple was about 8 foot tall. 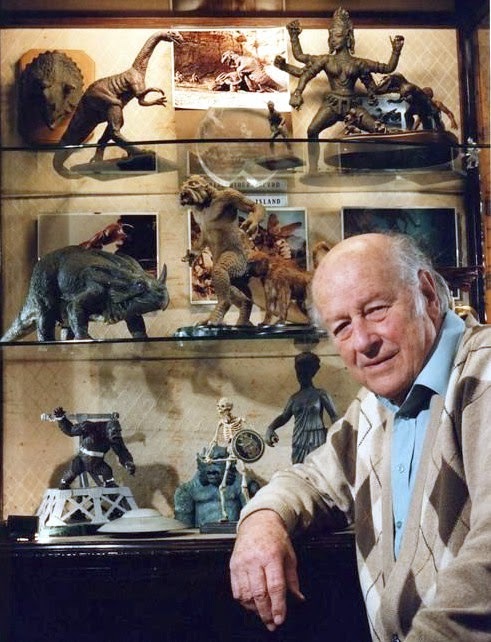 Long time Harryhausen collaborator, Lighting Cameraman Wilkie Cooper was brought on board to photograph the numerous miniatures sequences. Cooper's career went way back in the UK film industry with, among other things, photographing mattes for Albert Whitlock in his early days at Rank. 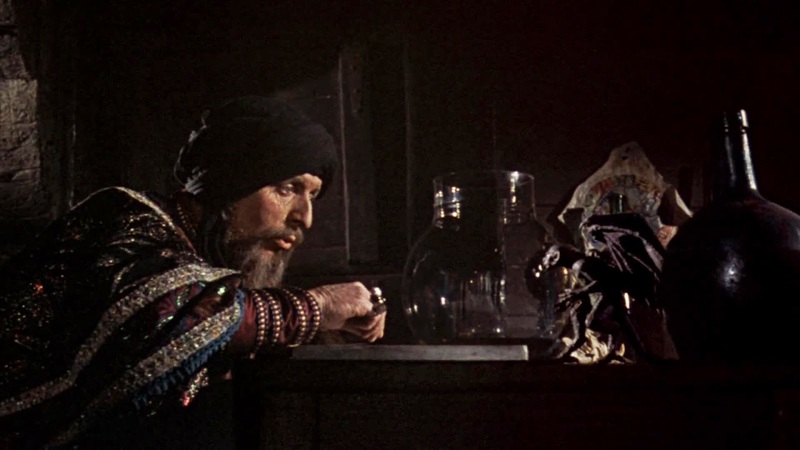 The Oracle as played by the Irish actor Robert Shaw (unbilled and unidentifiable), shot separately and dropped in optically in post production. 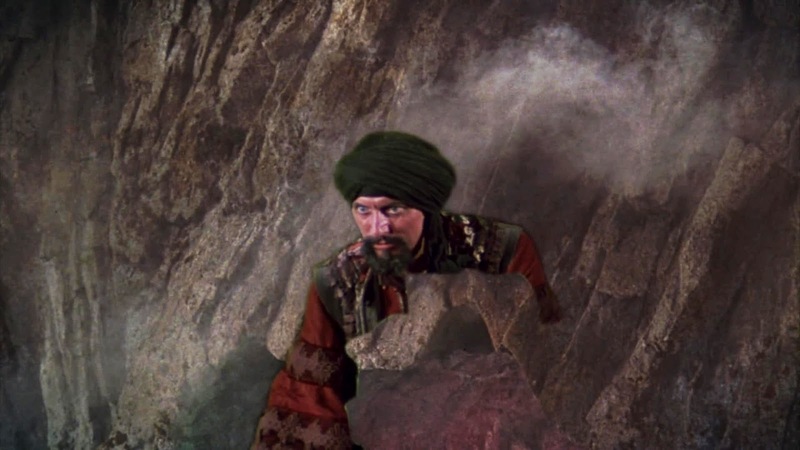 ..."Will Sinbad and his pals find a way out? 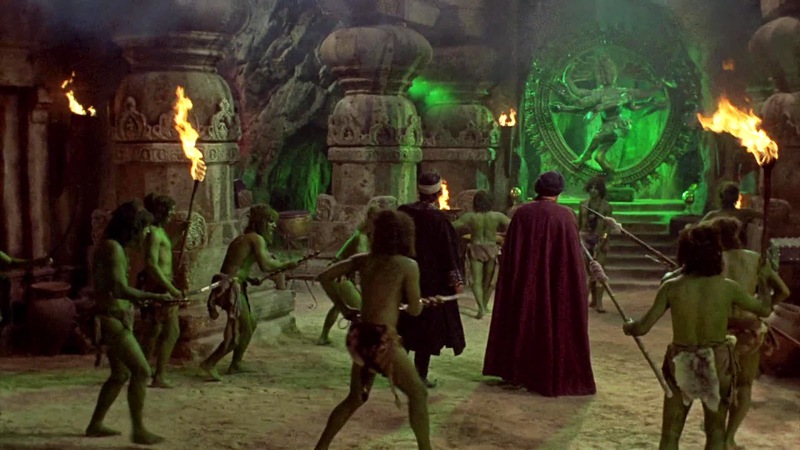 ... Will Caroline Munro get a line of dialogue? The answer to these and many other pressing questions will be revealed same time, same channel, next week!" 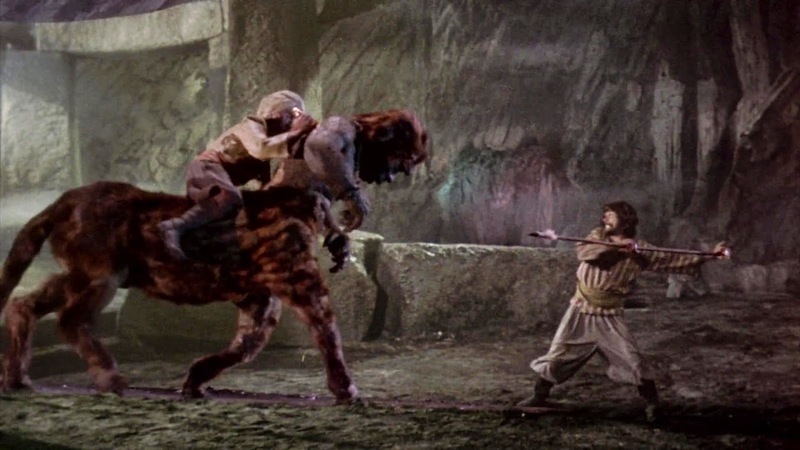 The Homunculi tries to thwart Sinbad's escape attempt. Again, nice stop motion and excellent compositing. 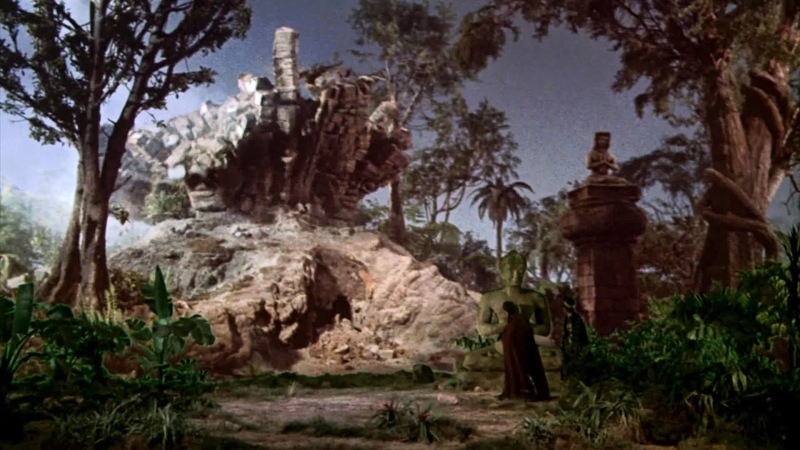 The Temple of The Green Men - all miniature with actors dropped in as blue screen elements. Wide view with miniature set and matted in extras. 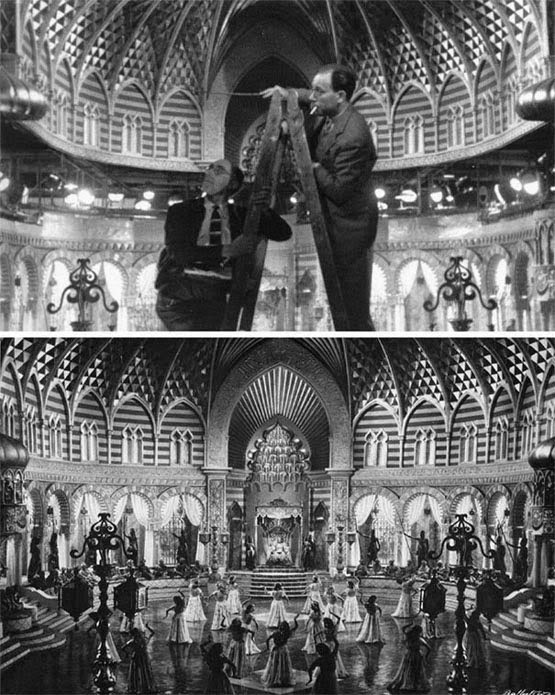 Rare behind the scenes frames demonstrating the elements for assembly of the temple optical matte, executed by Vic Margutti at Rank Laboratories in London. I've only ever had a blurry B&W version of this pic so I was thrilled to discover a high quality colour version of the same shot on the web by chance. 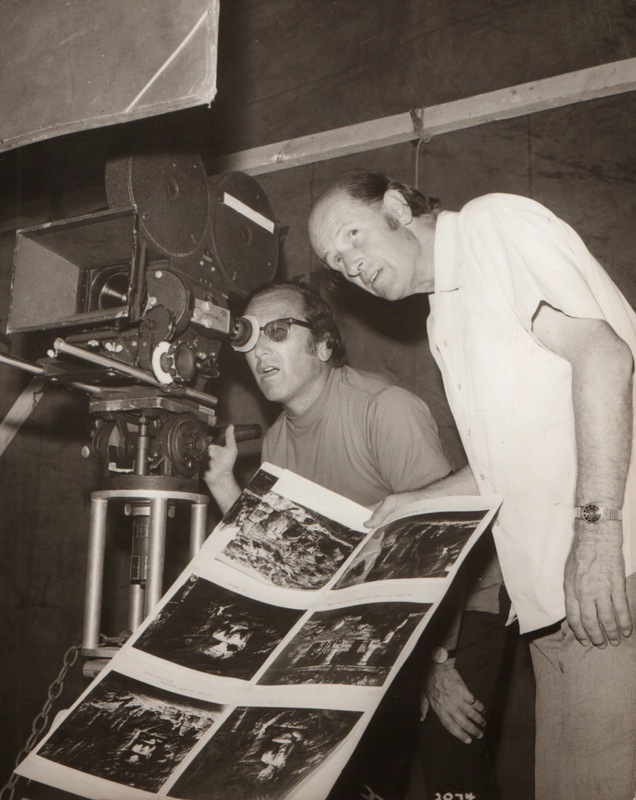 A tremendously revealing photo where we can see lighting cameraman Ted Moore and Ray setting up a shot on Francisco Prosper's miniature set. Another blue screen matte, quite outstanding too considering the inherent artifacts that often go hand and hand with the travelling matte composite photography process. Some of that evocative art direction that I spoke of earlier. 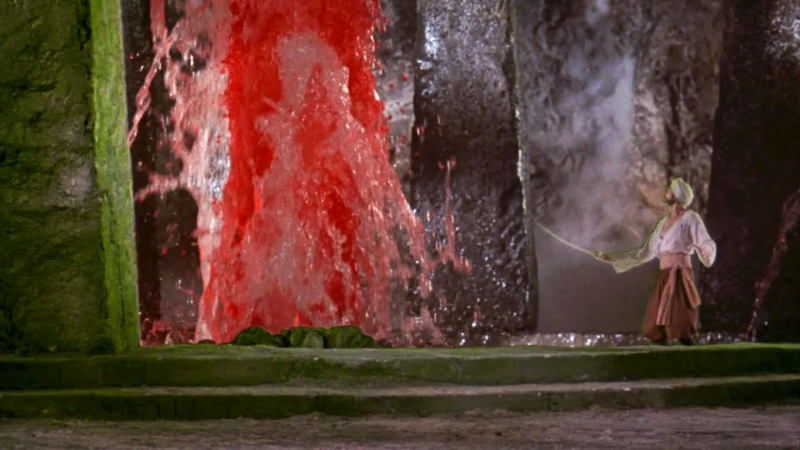 The lead in to the film's best effects sequence. One of Ray's scores of pre-production drawings. "I'm not such a bad guy... I'm just misunderstood". 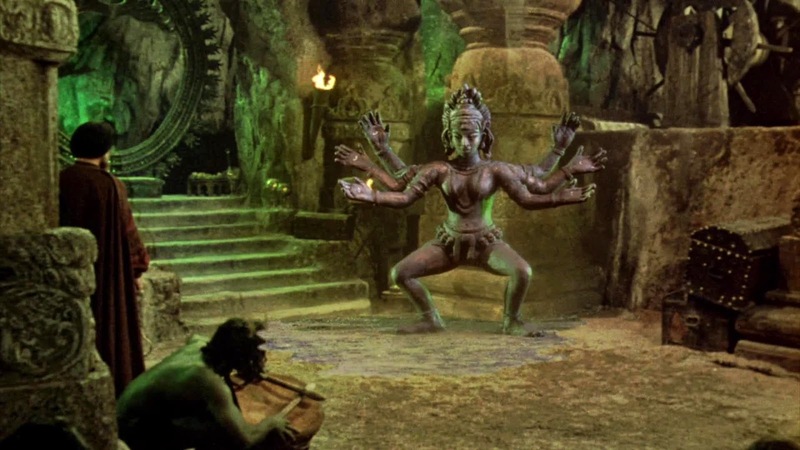 Kali the six armed goddess... seemingly harmless, but not by any means 'armless'. Once again, superb integration of Ray's animated puppet into Fernando Gonzalez' wonderful set. 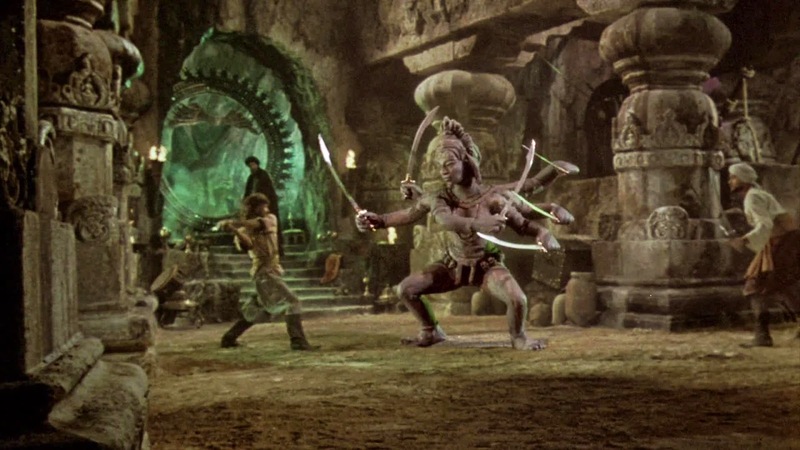 One of the rare examples in the film where any serious demarcation is evident between Harryhausen's Dynarama set up and the actual live action plate with an unfortunate colour mismatch. An extra's head moves under Ray's matte line in an otherwise exceptional animated sequence. 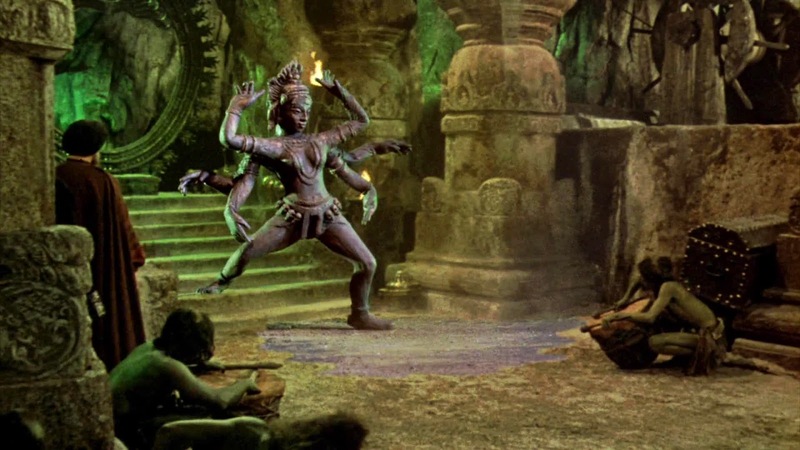 Ray at work on the magnificent Kali sequence. Still thrilling even after all these years. 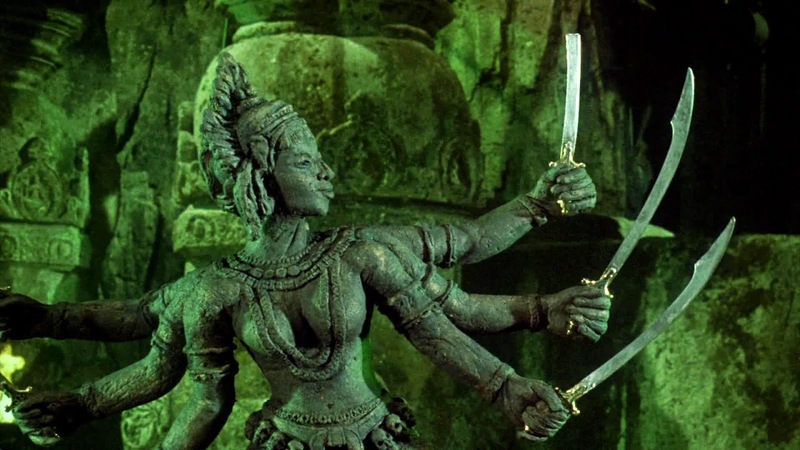 The unforgettable 'sword' sequence where each of Kali's six hands magically produce a sword, a scene that's sold with superb sound effects editing. 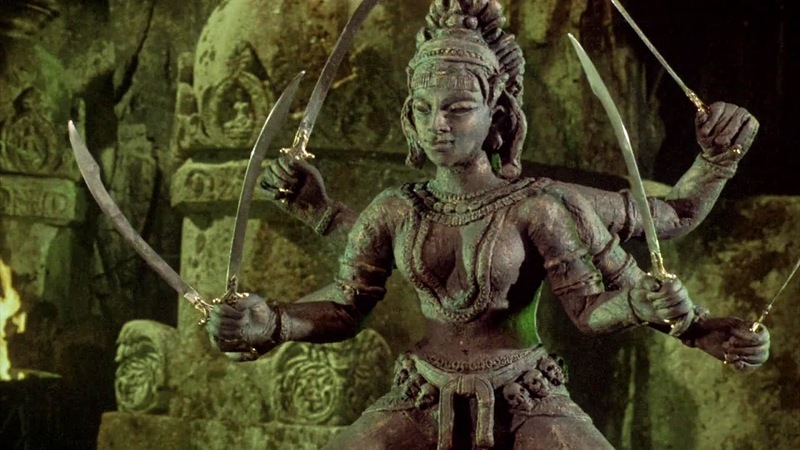 Kali - armed and dangerous! "That's not a knife.... THIS is a knife!" 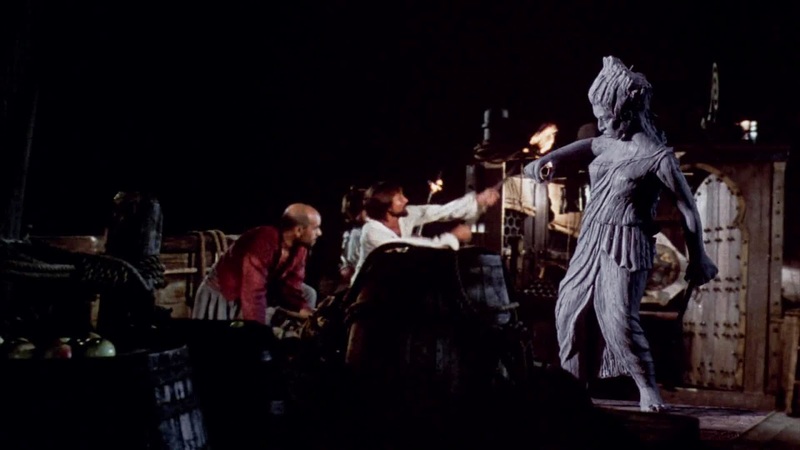 Meticulous lighting of puppet lends much to Harryhausen's stop motion. The Kali effects set up where we can see the tie downs under the animation table screwed into the Kali puppet's feet which would need to be unscrewed and re-screwed into the next pre-drilled tabletop hole for each movement. 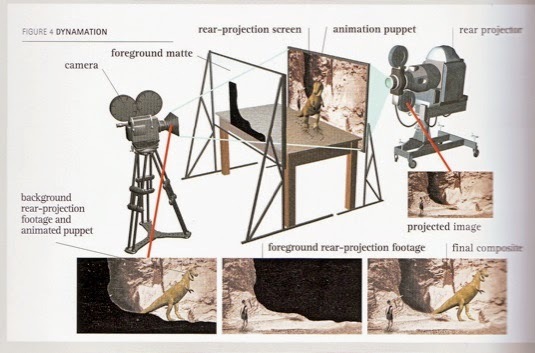 The animation table is eventually split screened out of the shot and replaced with the lower strip of the background process plate, thus sandwiching the animated puppet into a process screen shot. "No... for the last time, it's not Marilyn Munro, it's Caroline Munro!" 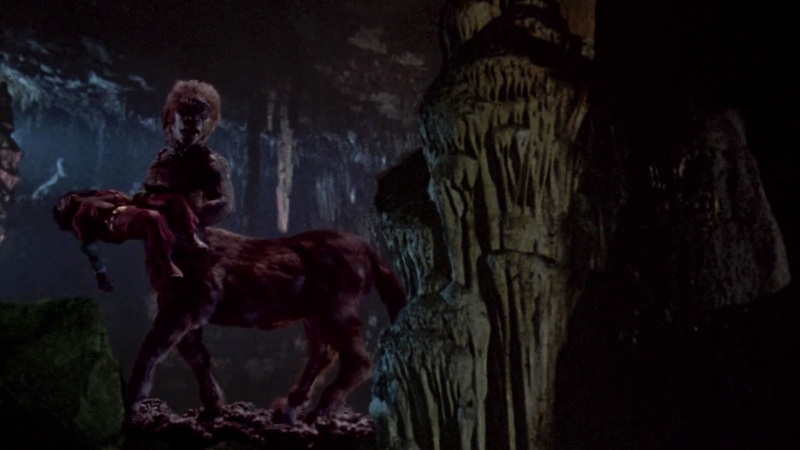 The arrival of the Centaur. 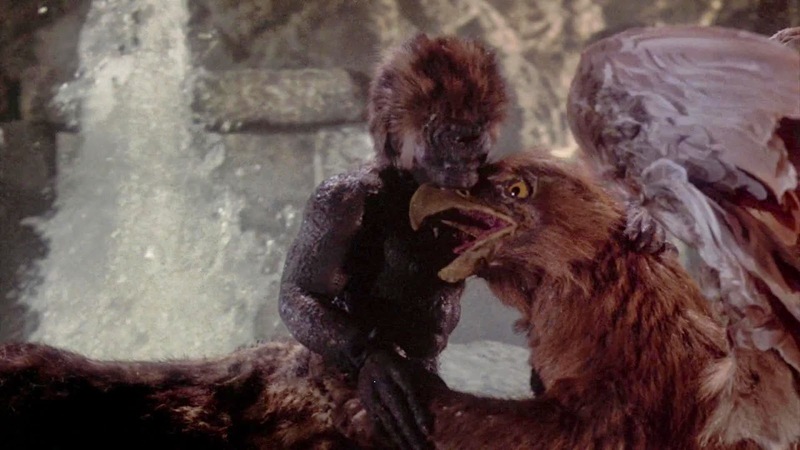 As previously mentioned, excellent merging of live action and stop motion work. Ray outdid himself on this show. 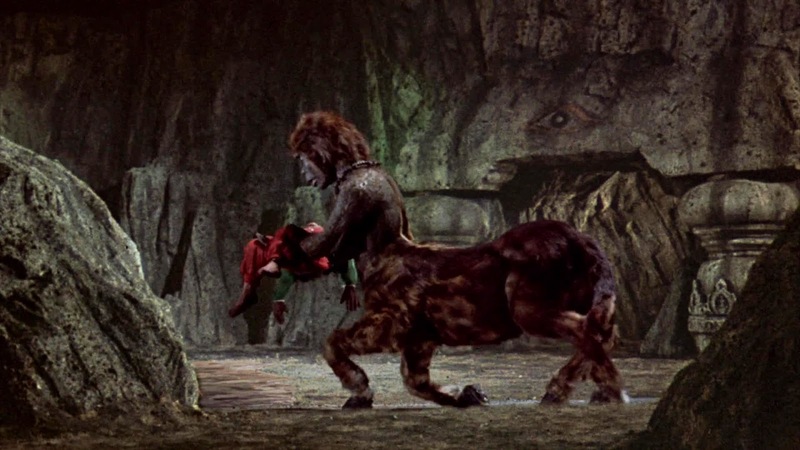 He always wanted to be the Centaur of attention! Beautifully atmospheric multi layer set up. The Fountain of Destiny - a fairly small miniature set with functioning water feature. 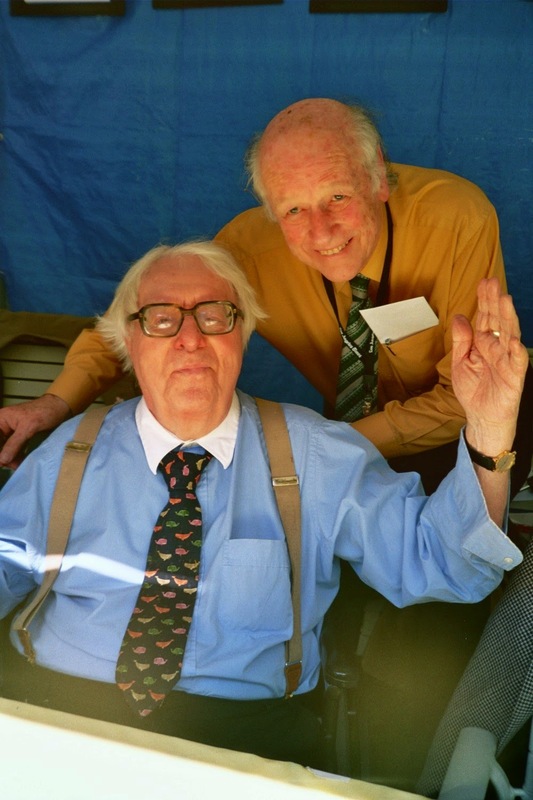 Tom Baker has been added to the shot later by blue screen. 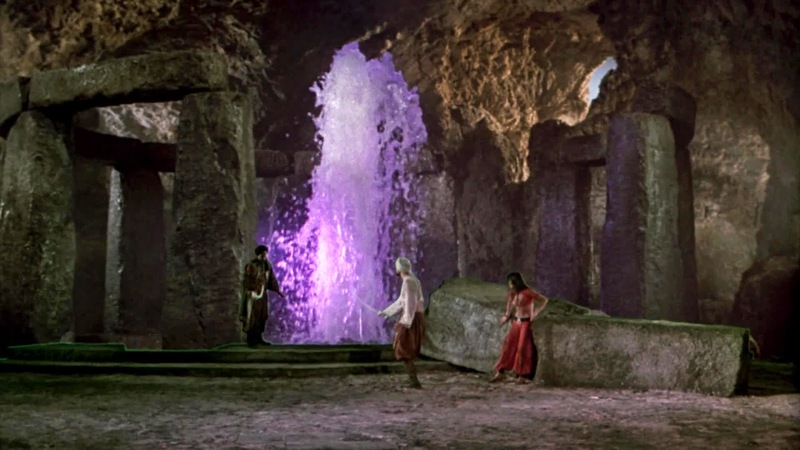 Ray and camera crew prepare for a Fountain of Destiny effects shot. 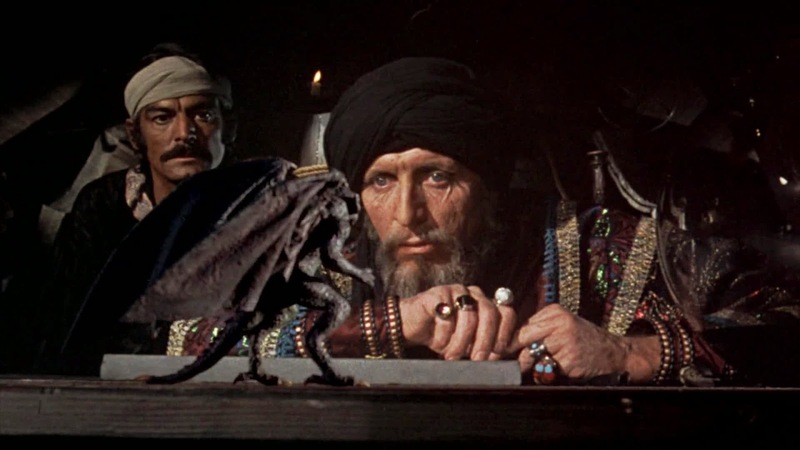 Note the small figurine of Sinbad on the set. 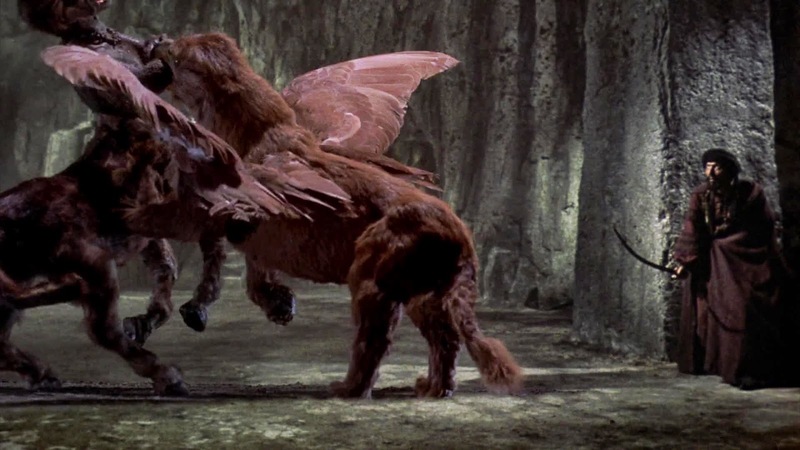 Another of Harryhausen's pre-production drawings for the climactic beast on beast battle. 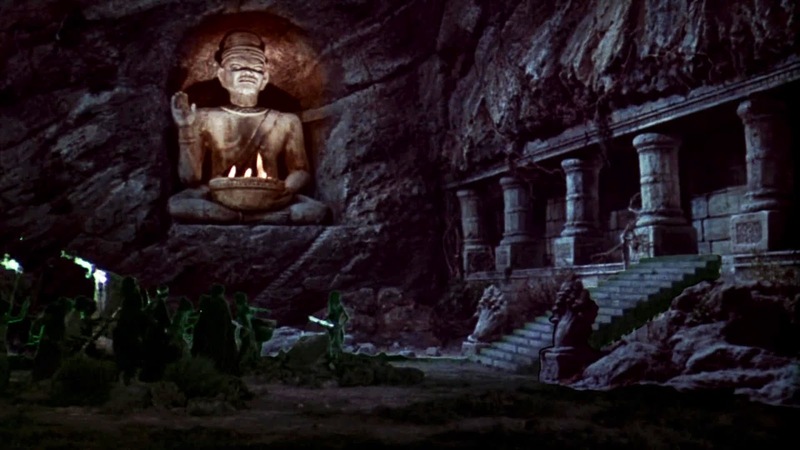 Wonderful composition from a great sequence. Multi element effects shot as Koura looks on in desperation. 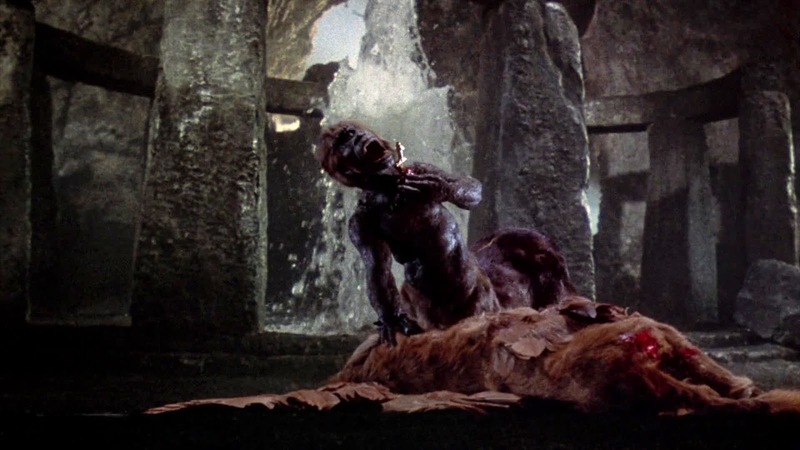 Battle of the Titans... great sound editing here. What a fantastic shot. Nothing in the follow up film EYE OF THE TIGER looked anywhere near as good as this. 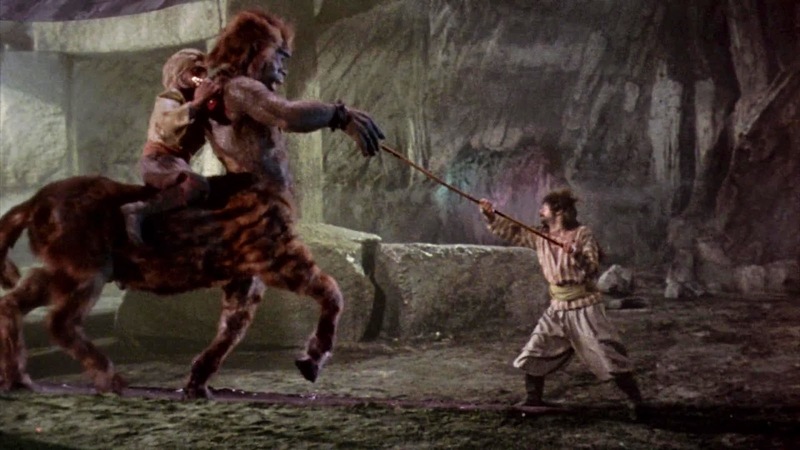 Sinbad puppet atop Centaur in fight to the death. Although the freeze frame may dampen the effectiveness, the motion shots look fine. Near Shakespearean tragedy in design and execution. 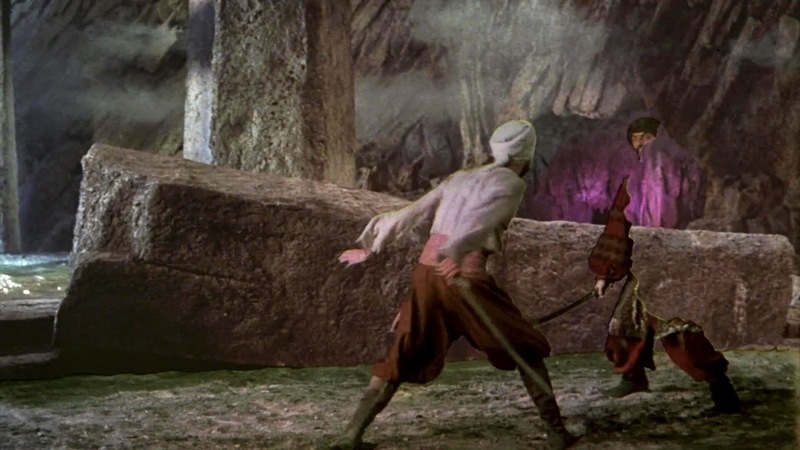 The finale as Koura uses all in his diminishing powers to eliminate Sinbad. An excellent composite where the performers have been skillfully matted into the entirely miniature set. Top notch optical cinematography. Koura invokes the dark powers to gradually turn invisible. 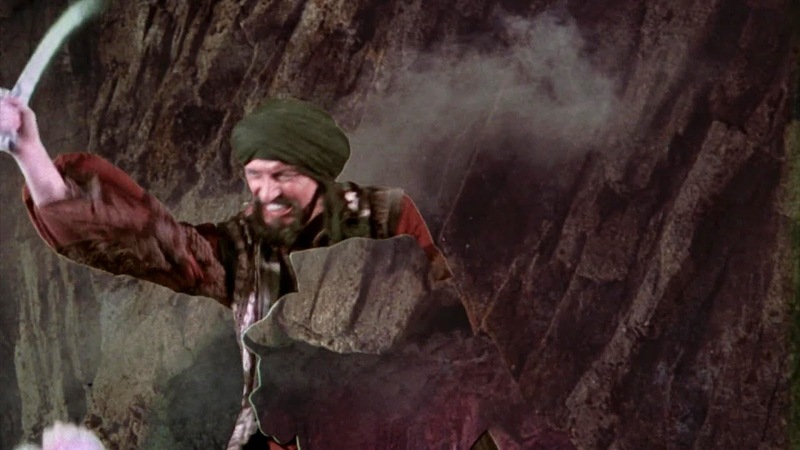 I understand that actor Tom Baker performed most of the fight sequence in front of a blue screen and held a blue shield in one hand to partly obscure his body. Really effective on screen. More first rate optical compositing. 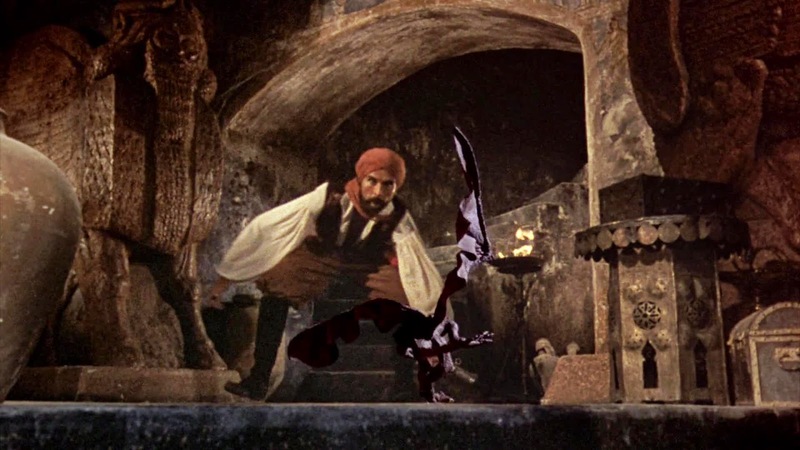 The moment of truth - Koura meets Sinbad's blade. Actors matted into miniature set. And that brings the film to a conclusion. 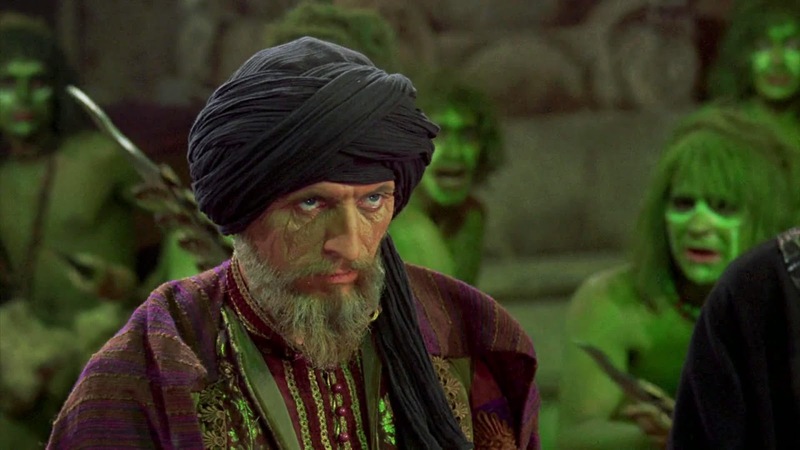 Koura is dead and the Grand Vizier has regained his youth. 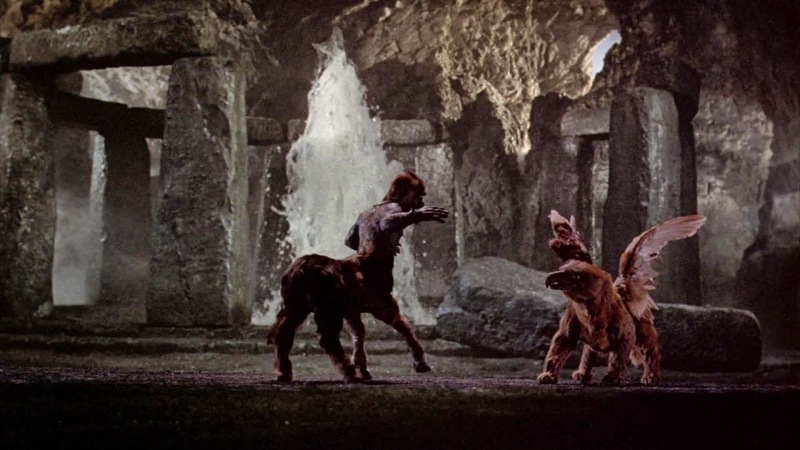 Actors performing in front of a large blue backing and matted into a miniature set.